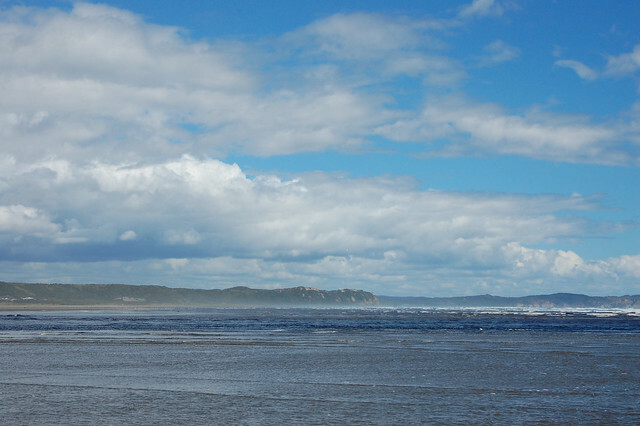 On my last full day in Chiloé, I experienced all of the things the island is known for: its changeable weather, its lush forests, and its privileged location on the Pacific Ocean. Waking up in Castro, the moody clouds foretold rain, but the journey to Cucao was going to take about two hours, so with any luck the skies would clear and we’d be blessed with the glorious summer sun. With Marilene, my travel companion from my time in Puerto Varas and Ancud, we headed up the hill to downtown Castro to take the regional bus to Cucao. On the way, the skies opened up and we got completely drenched, which was more amusing than anything else. That’s Chiloé for you! We bought tickets for the next departure, waited about 15 minutes, and soon were on our way inland to Cucao. 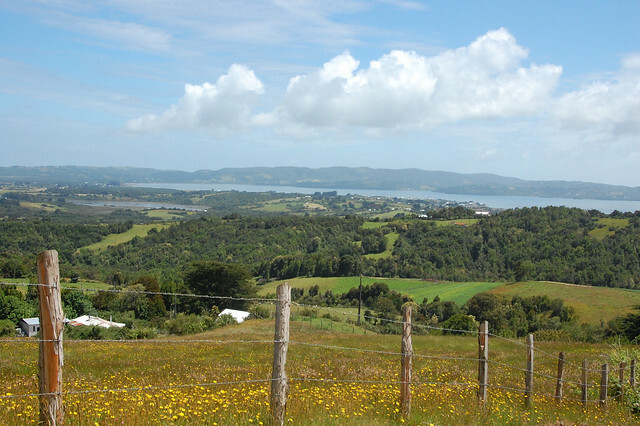 As I mentioned, Chiloé is known for its extremely fertile land and green landscapes, some of which I’d seen during my visit to Puñihuil with its detour through beautiful fields and farmlands. 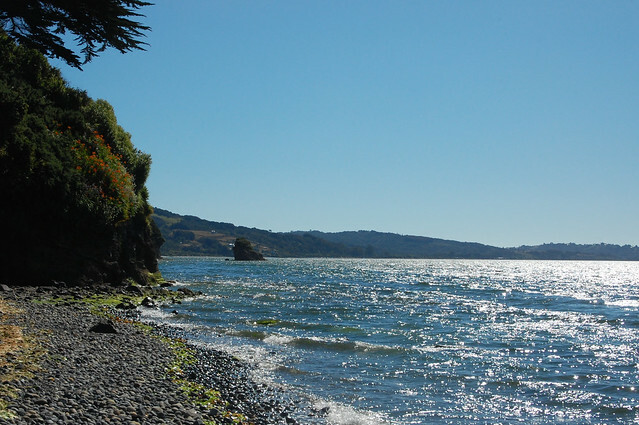 But if you’re visiting Chiloé, you definitely need to visit the national park, located on the other side of the island bordering the Pacific Ocean. 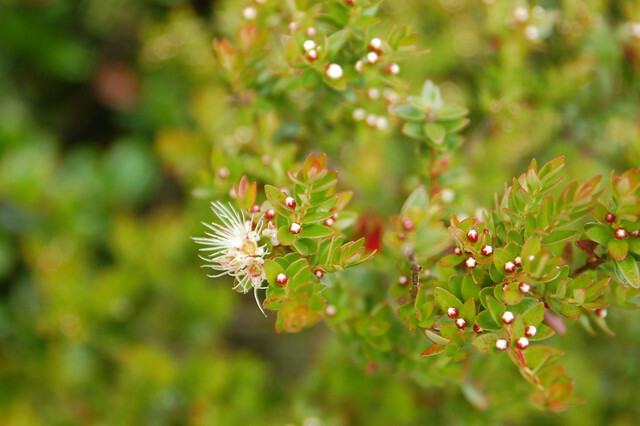 What many people don’t know about Chiloé, as well as southern Chile in general, is that it used to be covered with amazing native forests filled with biodiversity. 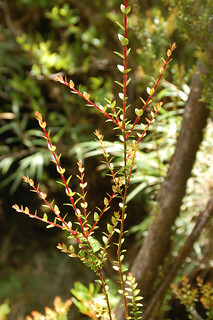 Due to the way Chile’s economy and society developed over the past few centuries, most of these native forests have been cleared away and have since filled in with new growth, or secondary forests, including species that have been imported from other parts of the world over the years. 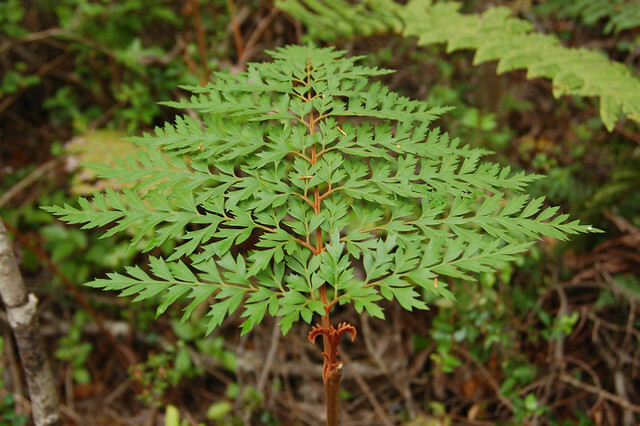 Parque Nacional Chiloé hosts one of these second-growth forests, but it is well-worth visiting to get a sense of the lushness of nature given the right conditions – and the massive rainfall on Chiloé! 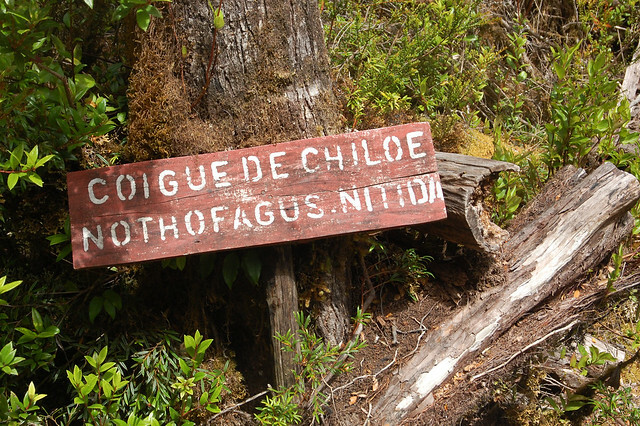 Like most government-operated parks in Chile, there are clearly marked, clearly determined paths through the national park, with trees labeled along the way so that you can get a sense of what you are looking at. 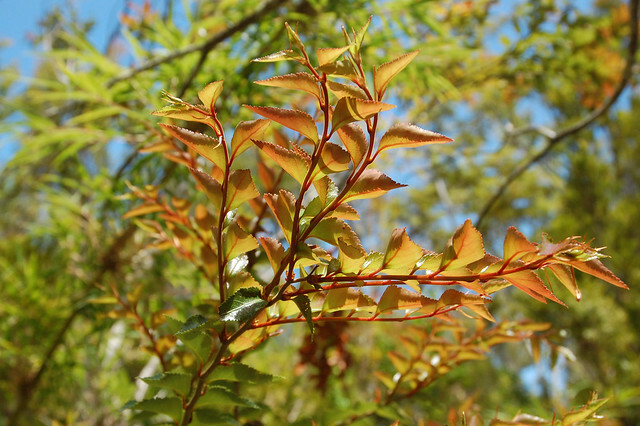 After so much time in the deserts of northern Chile, I was fascinated by all the beautiful foliage, which reminded me of my native New England and Marilene, of the forests of France. 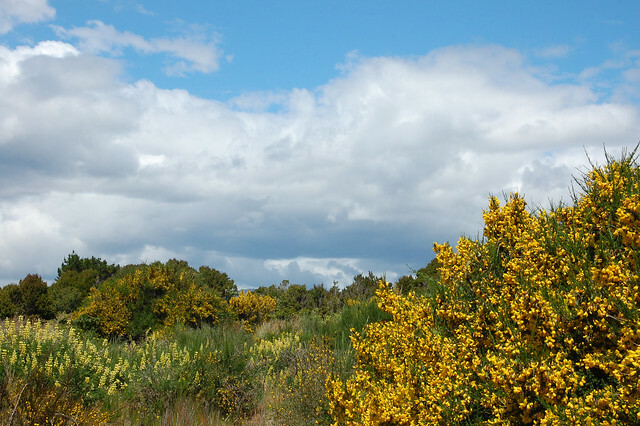 We wandered through the forests, coming out to a clearing in the marshland just as the skies themselves cleared and started revealing blue skies beneath the clouds. 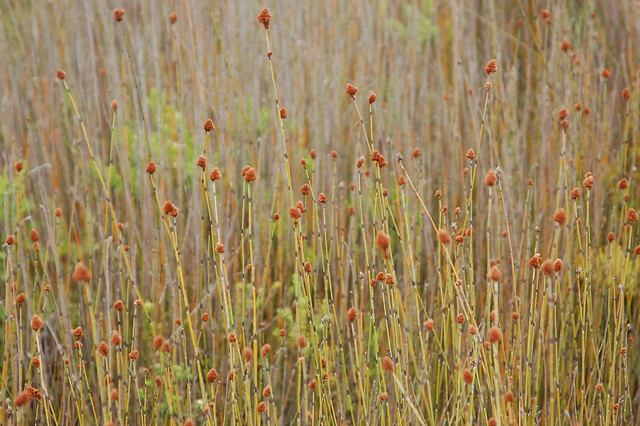 In this part of the park, the landscape changes to these beautiful reeds, and you can climb on a viewpoint to get a sense of the vastness all around you. I’m not sure exactly why the landscape changes so suddenly – were these lands left bare and filled in by other species, dried out by the occasional sun? 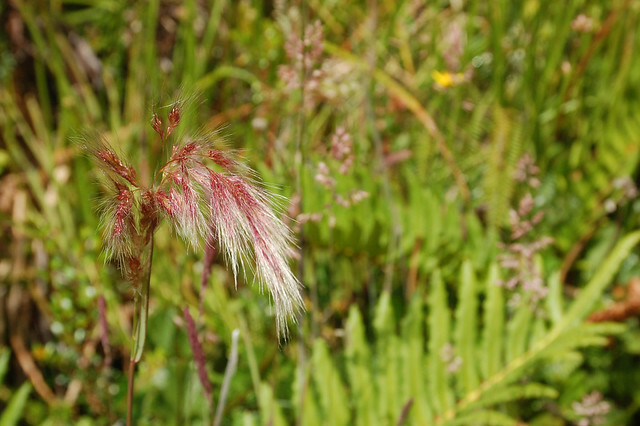 There are ferns and forest flowers everywhere, worth inspecting closely (as you can see that I did). 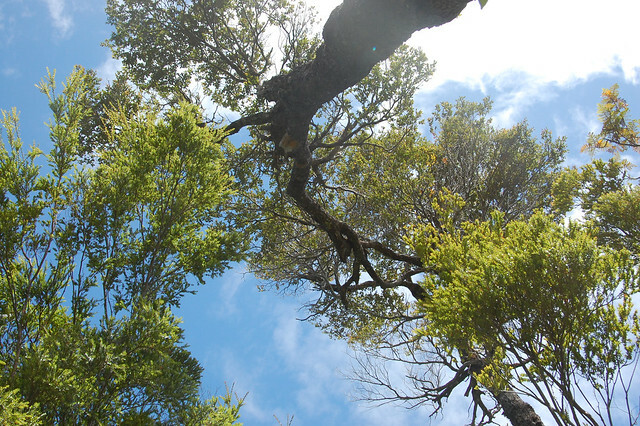 The last loop of this trail through the national park leads to the tallest trees hosting the most common species found on Chiloé. 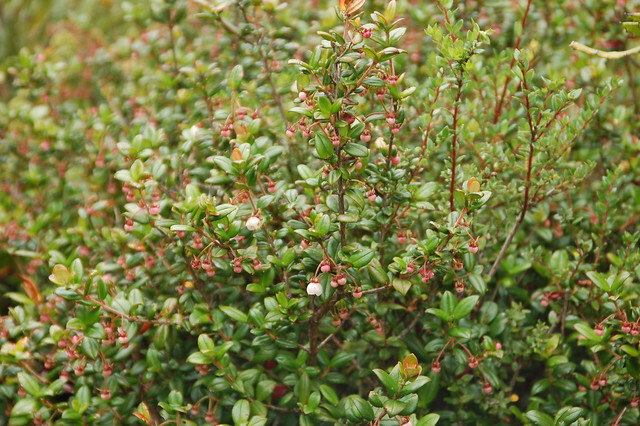 The coigue, pictured above, is known as Dombey’s beech in English, and is one of the native species found in Chilean and Argentine Patagonia. As we finished our loop through the forest, the sun shone down in full force, creating beautiful light through the leaves of the trees above us. This made the rest of the day a lot more pleasant, as we had a chance to really see the colors of the national park and appreciate the views over the landscape. Looping back along the path, we retraced our steps towards the entrance. 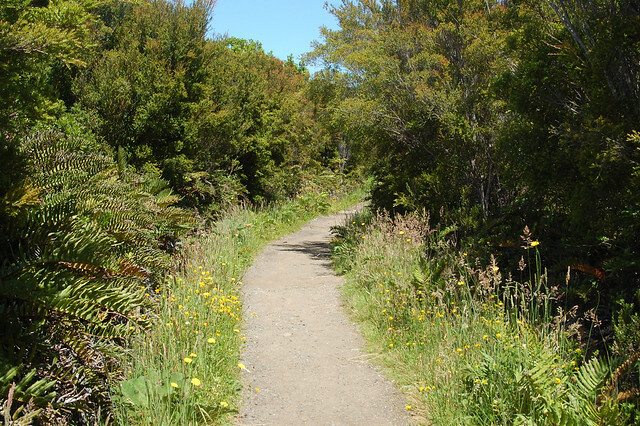 I should mention that the paths through the national park are easy and accessible for just about everyone – and there’s even a shorter path near the entrance for the very young and people who may not be able to walk several kilometers. It’s a nice walk for a few hours, as long as you’re not expecting to go trekking! It was totally worth climbing to the top of the viewpoint to see the views of the hills descending into the indigo blue waters. 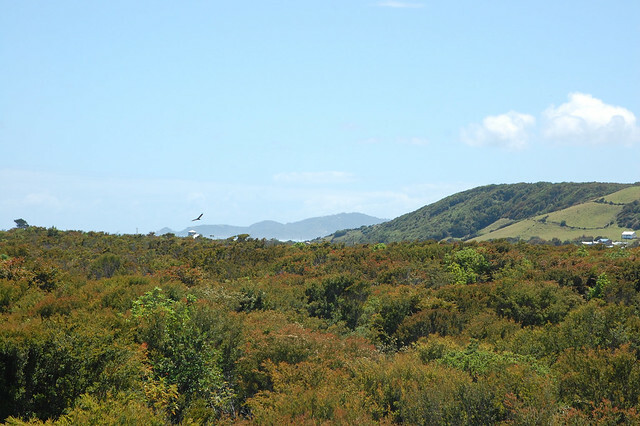 As we visited during the beginning of summer, the foliage was filled in with green leaves, making the views particularly striking. Because the clouds had lifted, we were able to get another perspective on the farmlands in the distance. If you look carefully, you can see a bird above the silo off towards the horizon. 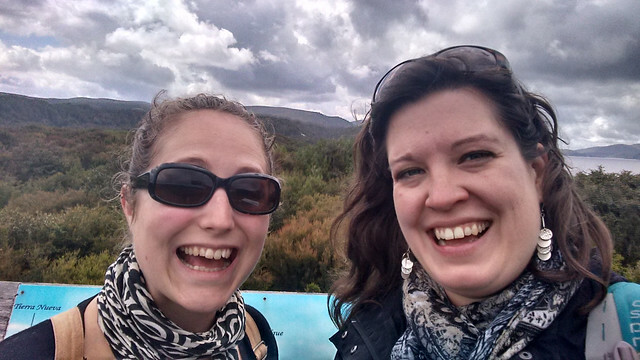 Of course, we had to commemorate our explorations with a selfie. Marilene is an excellent travel companion and I’m glad our journeys intersected. As two foreigners living in Chile, we had a lot to talk about – and a lot of experiences to process. 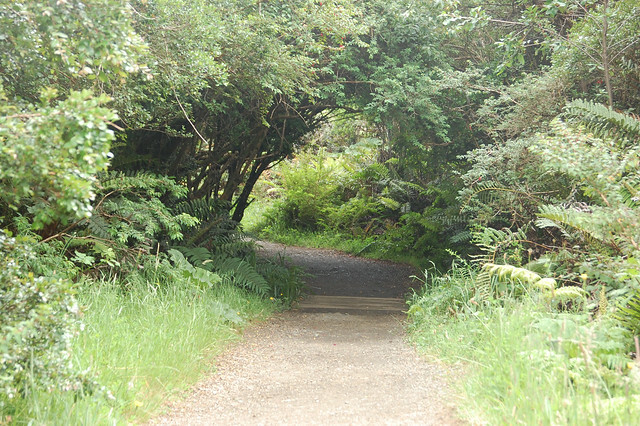 Back at the entrance to the national park, we ate our picnic lunch before exploring the other main path leading towards the ocean. 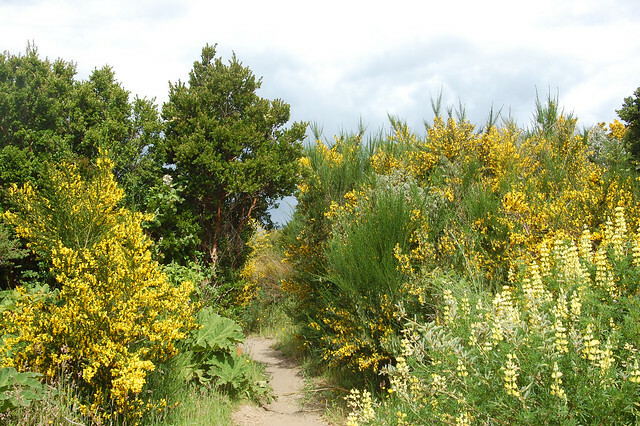 We were in for a treat; this path led through fields of cheerful yellow flowers. I was in heaven, snapping pictures left and right of the bright flowers under my much-loved blue skies. 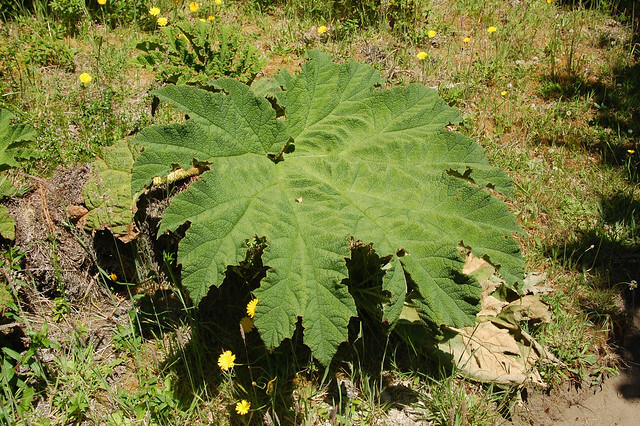 Throughout the day, we kept spotting this giant leaf-like plant. Any idea what it is? 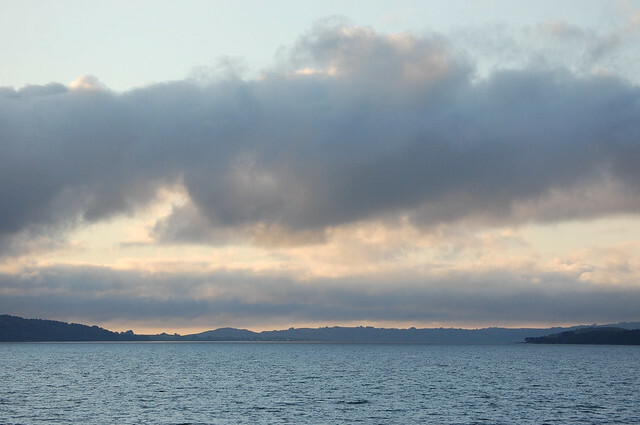 Of course, we can’t forget the beautiful, ever-changing clouds – Chiloé is a perfect place for cloudspotters like me. As we approached the ocean, I heard the low hum of the waves crashing, even asking myself what that was, until we came out to a viewpoint and realized it was just the ocean from a distance! 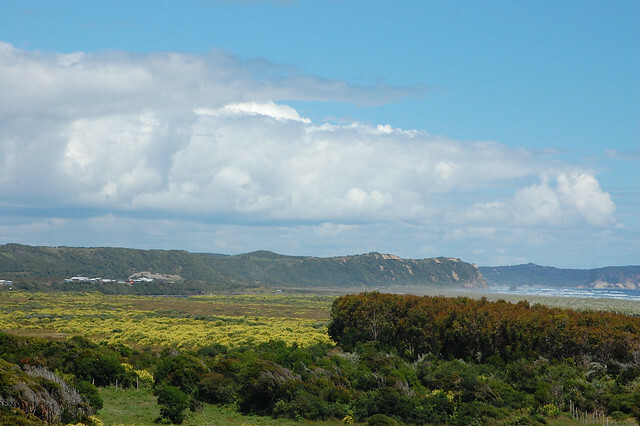 I loved the views as we walked towards the beach with the green-tinged cliffs off in the distance. For me, this was the highlight of the day. 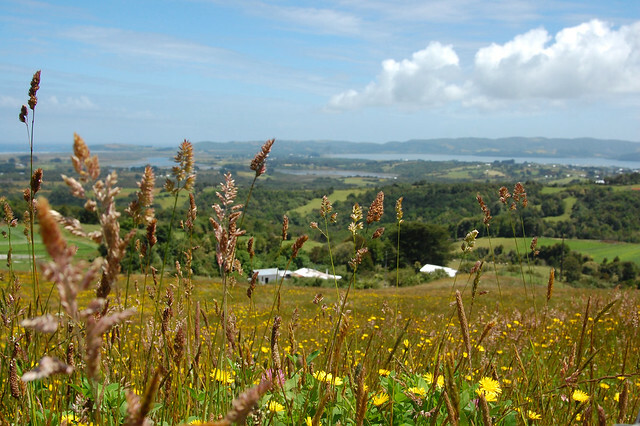 Check out those fields covered in wildflowers and nature’s palette in all its glory! 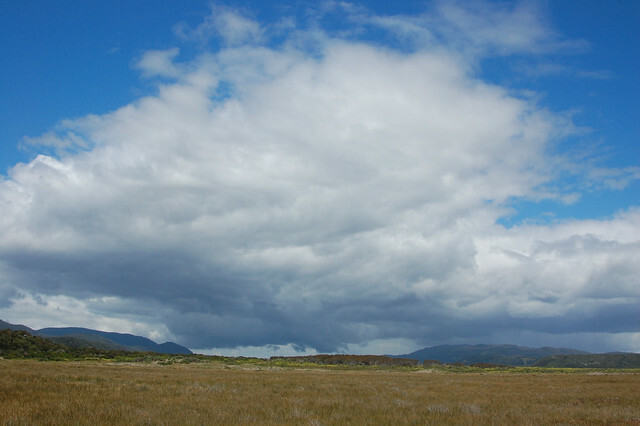 Let’s not forget the imposing clouds towering over the wide-expanses visible all around us! After a ten minute walk, we arrived at the beach, where we decided to relax for a while, just taking in the amazing views all around us. There were a few other people walking along the shore, but it was incredibly peaceful. Just nature, being beautiful, no big deal. 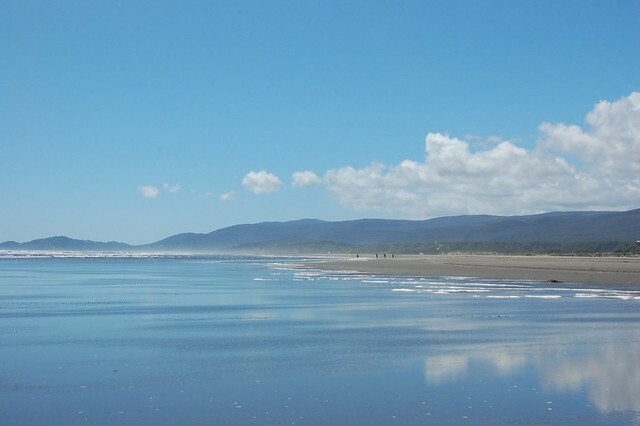 This is probably my ideal way to experience the Pacific Ocean – miles of near-empty beaches, wandering barefoot through the sand. I loved the reflective surface of the ocean and watching other people explore the coastline. I can still remember the feeling of standing in the water and just realizing the vastness of the earth all around me. One of those unforgettable travel moments that remind you how much you have to be thankful for. After lounging for a little while, we headed back towards Cucao to begin our return to Castro. 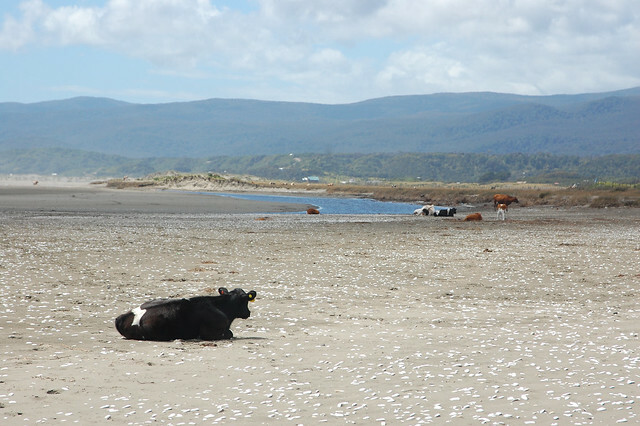 We spotted the cows just chilling on the beach like we had been a few moments earlier. As you can see, the national park’s path border nearby farmlands, making it impossible to get lost even if you wander up and down the shore for a while. 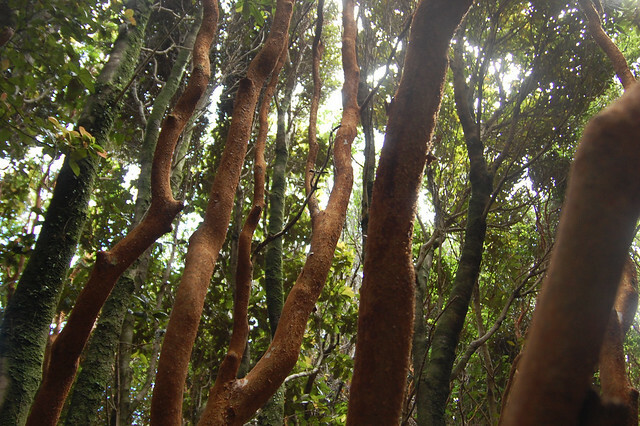 After a couple more glances at the fascinating colorful landscape around me, we returned through the forest on our way back to Cucao proper. We took one final detour and ended up seeing more beautiful trees. 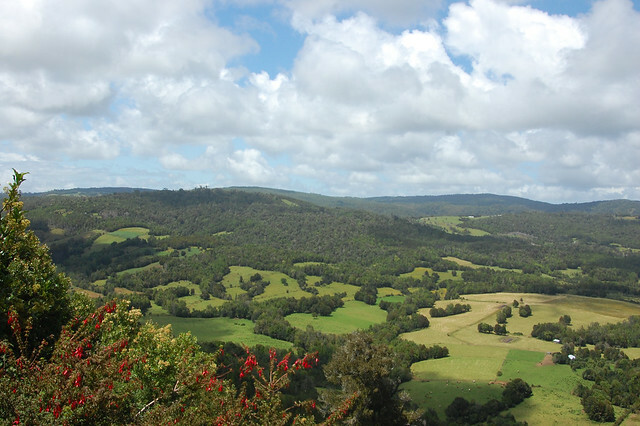 I suggest spending a leisurely day wandering around the national park – it’s small, but it’s worth spending a restorative day breathing the fresh air and appreciating the simplicity of nature. 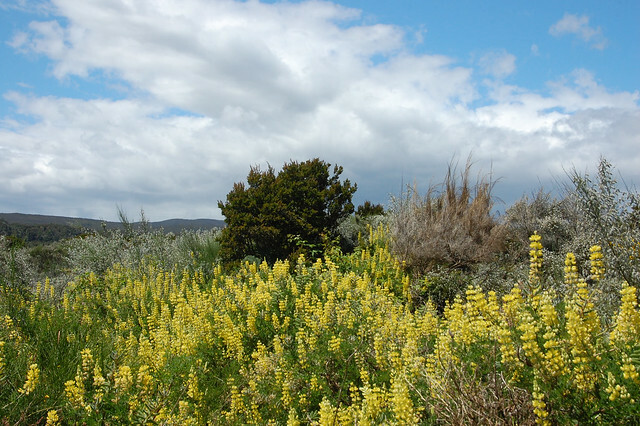 Back through the fields of flowers, we found our way once again to the main road and walked towards Cucao rather than back through the national park. Lucky for us, the bus stop is actually outside one of the restaurants located outside the park in tiny Cucao, and we had just enough time for some tea and a snack. 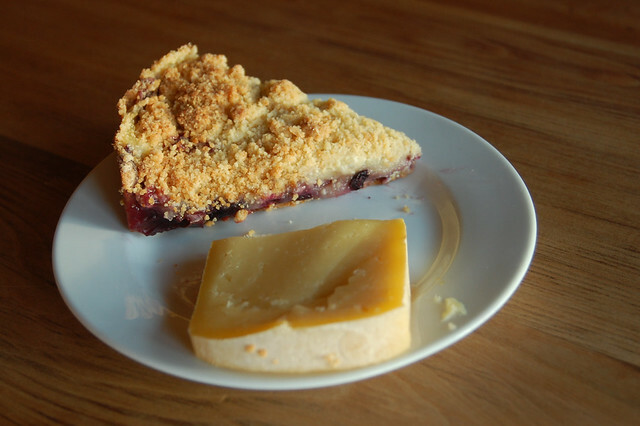 I was curious to try the other type of kuchen, this one topped with a barely sweet custard and blueberries. Mmm. 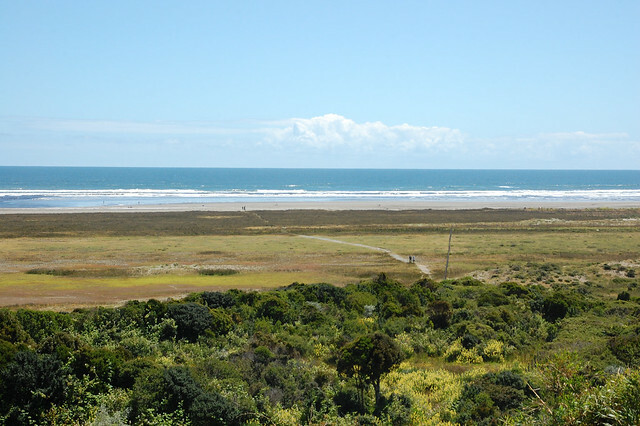 As you can see, visiting Cucao is an excellent idea for a day trip during a stay on Chiloé – just be sure to take the path to the beach as well as the paths through the forests! Buses to Cucao leave from Castro’s regional terminal on a regular schedule, about every 30 minutes to an hour. One way fares cost $2000 CLP and if you buy round trip tickets, it costs $3500. Cucao is tiny, and the bus drops you off in front of the national park and leaves from in front of one of the restaurants on the main road. The road continues after the last stop; this is where you can find the pathway to the beach. There are some lodging options in Cucao including a hostel, and it would totally be worth staying there for a night or two if you plan to enjoy a bit of a retreat from the city or want easy access to the beach. If I could do it over again, I would have gone directly to Cucao upon arrival in Castro, and then stayed in Castro on my way back. 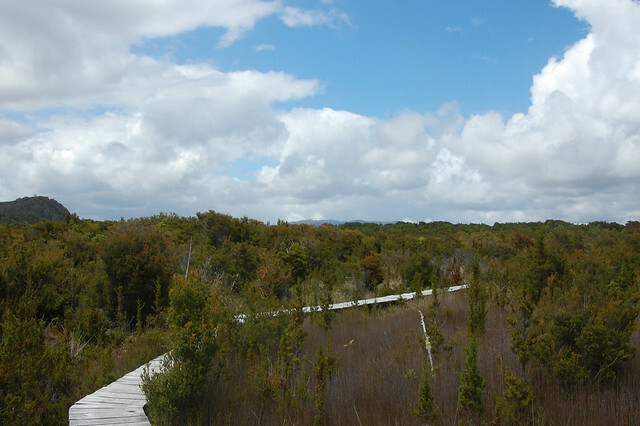 Parque Nacional Chiloé is run by CONAF, Chile’s national park service, and that means that it has all the installations you could need, such a bathrooms, a small visitor’s center, some facilities for kids, and clearly marked paths. Here’s the website. Admission for foreigners costs $4000 CLP. I suggest bringing a picnic lunch to enjoy on the beach – we would have eaten there if we had realized how close it was! You can also eat at the restaurant or just have a snack as we did. 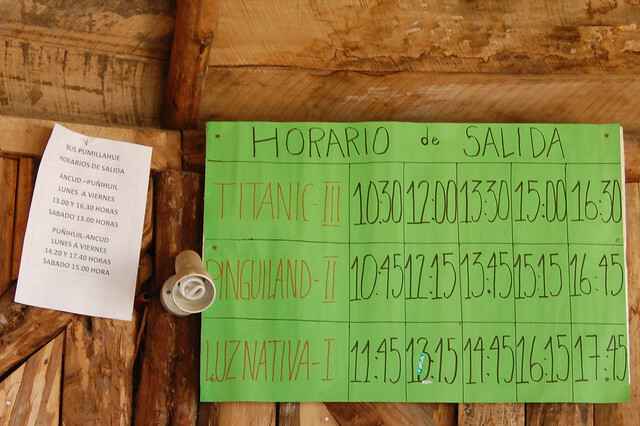 Like everywhere on Chiloé, prices are very reasonable. One of the interests that guides my travels throughout South America is my love of textiles and fiber art. Whether it’s knitting, crochet, weaving, or embroidery, if a region has a specialty, I want to visit that place and learn more about their art. In Peru, this passion brought me to Ayacucho to walk through stalls bursting with beautiful flower embroidery and to Huancavelica to appreciate the multicolored masterpieces (and yes, a few came home with me as well). After a year in Chile, I knew that sheep’s wool was southern Chile’s specialty. In Santiago, I’d picked up a knitted poncho from Chiloé, so I was looking forward to visiting the island and seeing more of what its artisans had to offer. 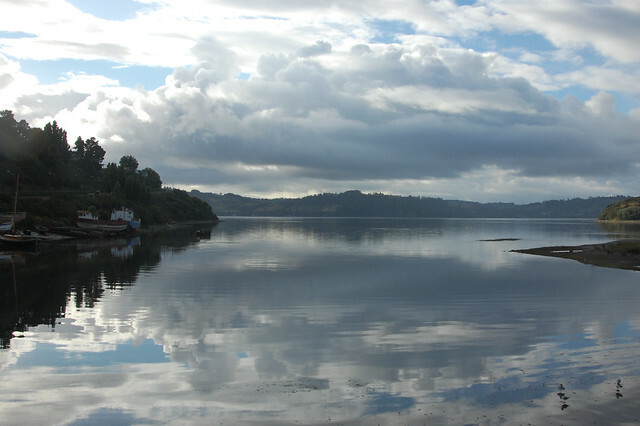 That’s what brought me to Dalcahue, a small town located about an hour from Castro, Chiloé’s capital. 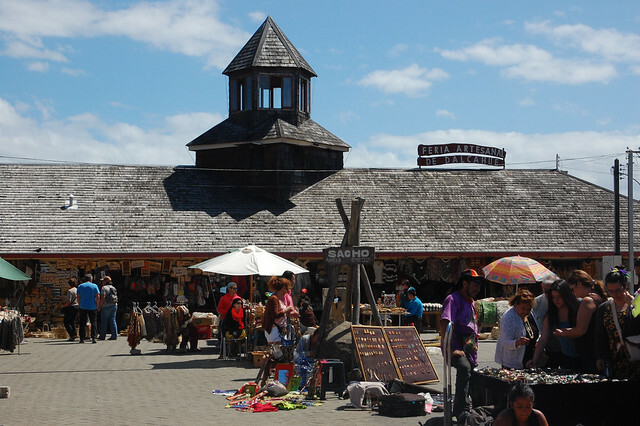 Dalcahue is known for its large Sunday market filled with stands after stands of woven and wooden goods made by locals, as well as hosting one of Chiloé’s most easily accessible wooden churches. 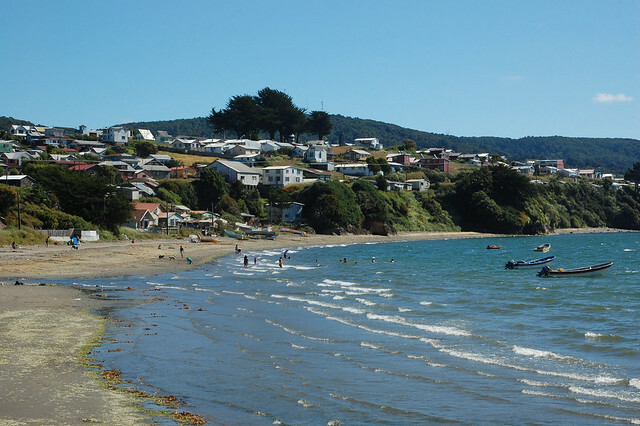 Dalcahue is a small town on the Isla Grande de Chiloé, just across the water from the smaller island of Quinchao, known for the picturesque towns of Curaco de Vélez and Achao. Its privileged location means that it has beautiful views of the water and the green island just a short ferry ride away. 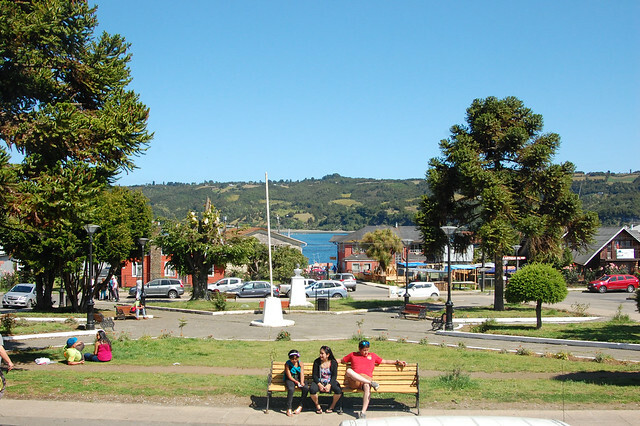 Dalcahue is probably one of the most visited small towns on Chiloé because it is easily accessible on the buses that leave from the municipal terminal in Castro and walkable, with all the main sites within a short distance on pleasant paved roads. 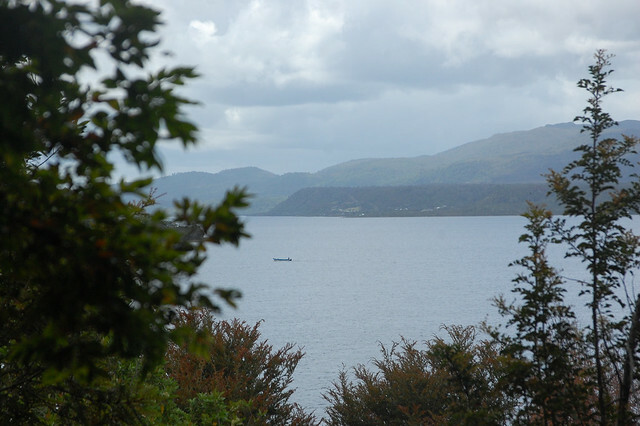 If you start early, you can visit Dalcahue and nearby Isla de Quinchao in a day, with plenty of time to get lunch at a local restaurant offering beautiful views over the water. 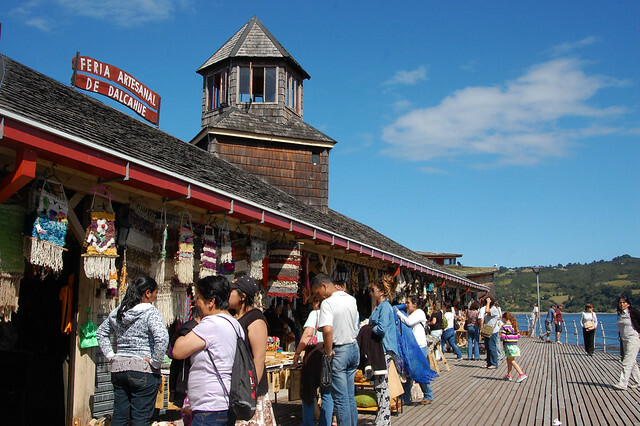 As I mentioned, I headed to Dalcahue because I’d read that the Feria Artesanal was the best and biggest market on the entire island, selling goods from every corner of Chiloé. The market is housed in an open building, with stands selling a variety of textiles, mainly knitted ponchos, hats, and socks, and woven bedspreads, tablerunners, and tapestries. Chiloe’s wool is a thick, coarse sheep’s wool either sold in natural colors or dyed in bright primary colors, giving the textiles a distinctive Chilote style. I spent an hour or so wandering the stands at the artisan market, considering a brightly colored blanket, and admiring the cute little souvenirs. Because Chiloé is often very cold, the island’s style is designed for warmth and functionality though there are some artisans making more stylish clothing, ideal for a Santiago winter. Outside the main building, more informal artisans have set up their booths with jewelry and other interesting wares, and behind the markets there is another building with many small restaurants serving super fresh fish. After considering my options at the main artisan market, I wandered towards the church, but then I spotted another small artisan market located right on the water, called Feria Artesanal Manos Chilotas, or the Hands of Chiloé Artisan Market. Intrigued by some gorgeous weavings hanging from one of the booths, I wandered over. As it turns out, this little artisan market is much more artisanal than its neighbor. These booths are run by the actual artisans, women that create their own designs and have much more refined, creative styles. As they explained, the bigger market has goods that are mass-produced for the commercial market, which was why nothing really got my attention. But this artisan market was filled with unique pieces and I ended up buying a couple of beautiful items. 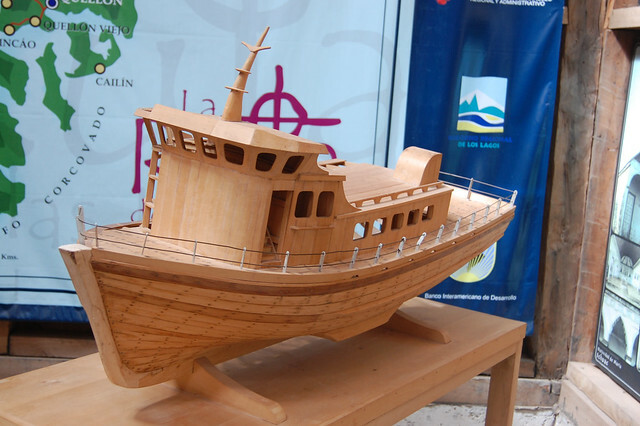 If you visit Dalcahue, make sure to take your business over to these stands – you’ll find more interesting pieces and support the artisans directly. 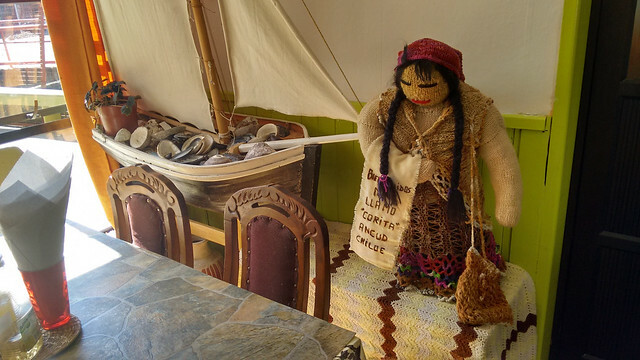 These women are keeping the traditions of Chiloé alive and infusing them with good taste – and the prices are still reasonable. From there, I headed over to Dalcahue’s small plaza in order to see the heart of the town and especially its church, the Iglesia de Nuestra Señora de los Dolores. Dalcahue’s church is one of the 16 wooden churches now on UNESCO’s World Heritage List, although there are many more than that on Chiloé. 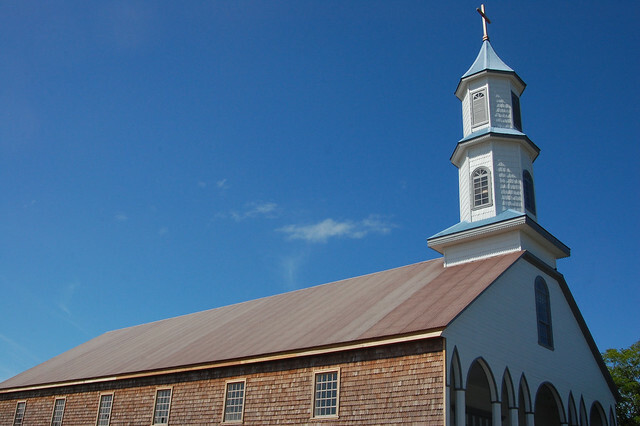 After checking out the Visitor’s Center and museum explaining the construction of these churches back in Ancud, I was curious to explore one for myself. 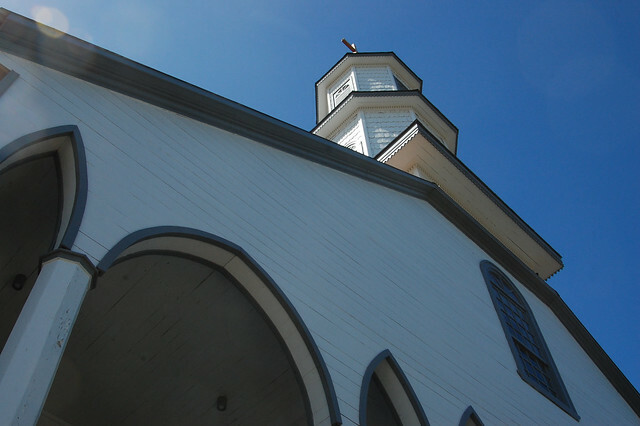 Iglesia de Nuestra Señor de los Dolores is appealing because of its muted colors and traditional wooden construction. You can see the ship-building techniques and the wooden shingles characteristic of the Chilote construction methods a century ago. Although I’d been able to appreciate the attractive exterior of the church in Castro, I had yet to see inside one of Chiloé’s churches, so I definitely wanted to do so in Dalcahue. 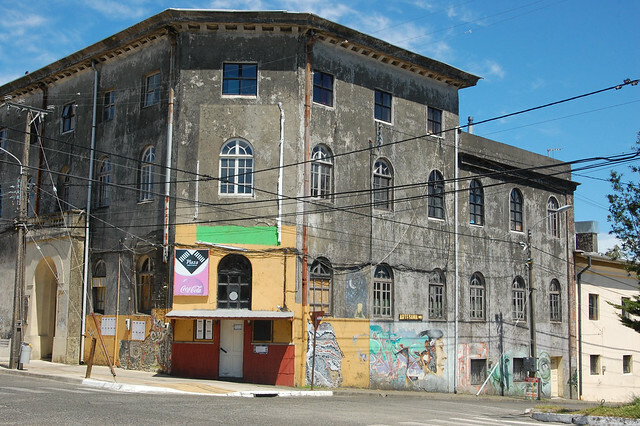 Entry is by donation, just S500 CLP (less than $1) to support the conservation of this historical buildings. 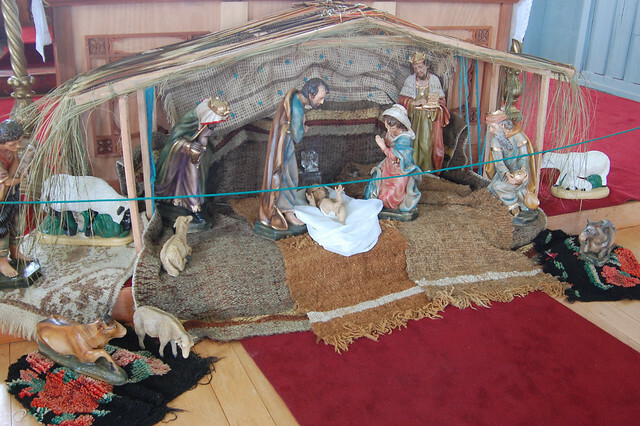 Since it was just after Christmas, the church still had a little manger up which displayed small figurines resting on tiny weavings in the Chiloé-style. Adorable! I appreciated the calming, subtle colors of the church’s interior and the solid construction of its supports, all made from wooden. Definitely a change from the stone cathedrals around the rest of South America, left over from the Spanish colonies centuries ago. It was surprisingly challenging to find a good angle to take in the entire church as it is located right on the main plaza with a tiny parking lot out front. 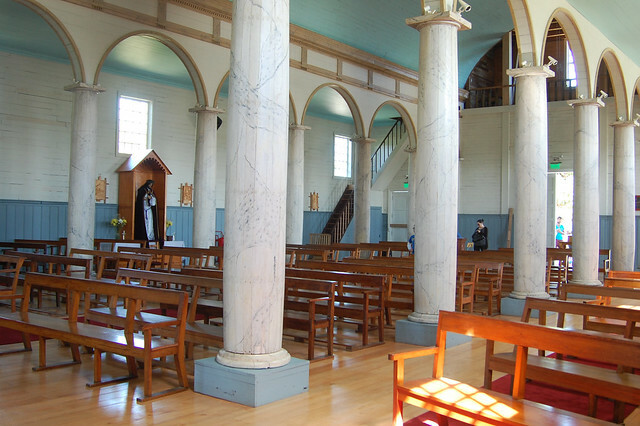 You can see from photos of other churches on the island of Chiloé that these churches were functional and integrated into daily life of the townspeople, giving a sense of Chiloé’s down-to-earth culture. After checking out the church, I headed back through the plaza to the waterfront to look at the stores lining Pedro Montt. Although it’s not pictured, there is a cute little café on this street called Casita de Piedra. The café is upstairs and has big windows with views over the water, and the entry-level of the little house has a gallery with carefully curated artwork and textiles from Chiloé. 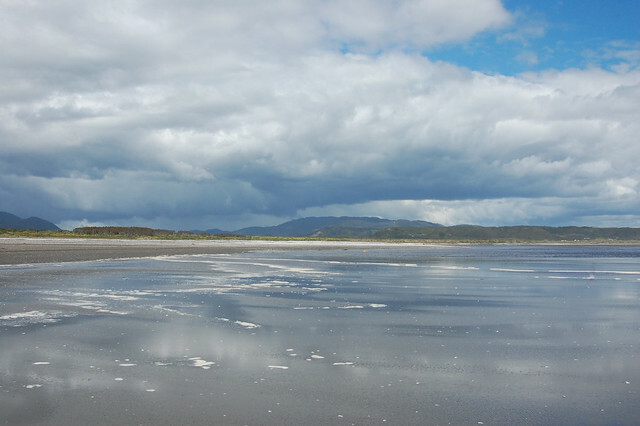 Besides that, there’s not much else to do in Dalcahue, besides appreciate its laidback, residential atmosphere. Buses regularly run along Freire, the main commercial street, making it easy to head back to Castro whenever your wanderings come to an end. As you can see, Dalcahue is worth an afternoon’s exploration, especially on Sunday when its artisan market is in full swing. I felt like visiting Dalcahue gave me another perspective on Chiloé outside of its main cities. 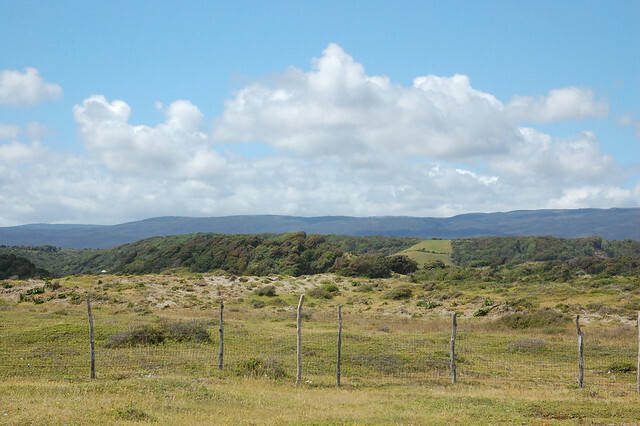 If I’d had more time, I would have liked to pop over to the Isla de Quinchao for the more rural perspective, but in the end I decided that I was more interested in getting over to Chiloé’s national park the next day. 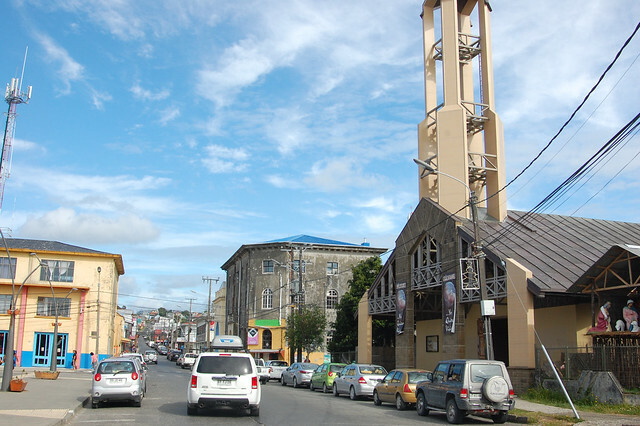 Dalcahue is located about an hour away from Castro on one of the buses that runs regularly from Castro’s municipal bus terminal. The fare cost $800 CLP each way in January 2016. 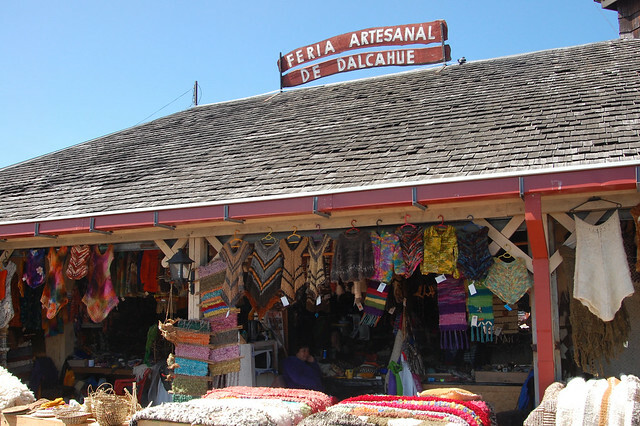 Dalcahue is best known for its Sunday feria artesanal, or artisan market, which is located down by the water on Pedro Montt. There are several signs around town pointing you in the right direction. There are several small restaurants selling fresh meals located next to the market, and informal artisans also set up shop in the small plaza next to the market. Make sure to continue down Pedro Montt until you spot Feria Artesanal Manos Chilotas, a small building with open booths run by artisans who produce their handiwork in small quantities. I felt the quality of their work was much higher than the commercial market, and the vendors were friendly and happy to explain their techniques. 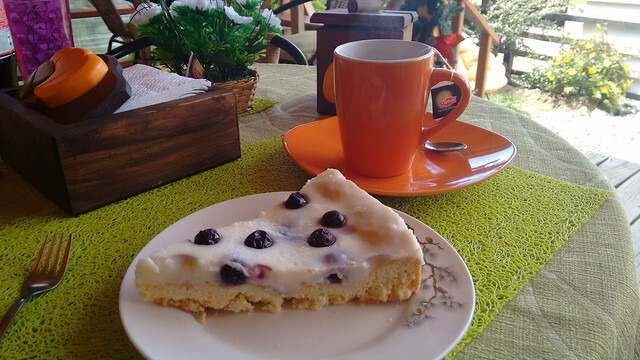 I also recommend having tea or coffee at Casita de Piedra, a cute restaurant with views of the water. I really liked the quality artwork on offer in their small gallery/shop at the entrance level; there are some unique items I didn’t see anywhere else. 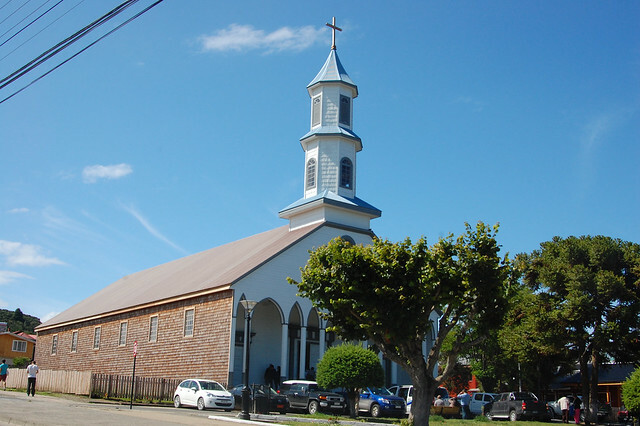 Don’t forget to check out the Iglesia de Dalcahue, officially the Iglesia de Nuestra Señora de los Dolores. This is a well-preserved wooden church and entry is only $500 CLP (donation). 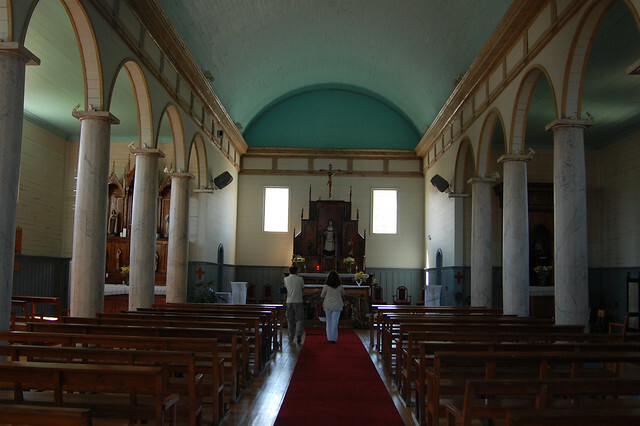 After learning about the churches in the museum in Ancud, I felt seeing this classic example was worth the trip. 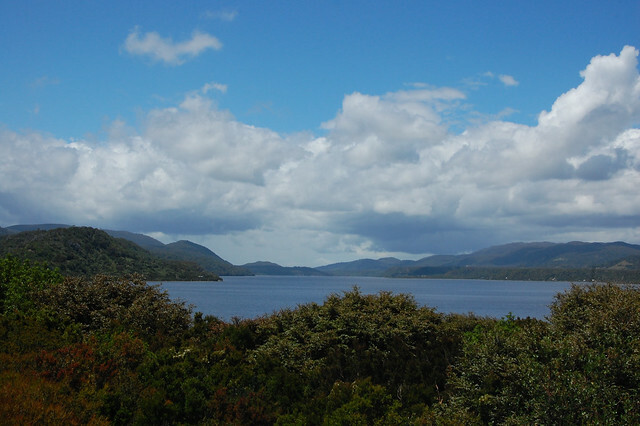 If you want to stay in Dalcahue, there are a few hostales in town, and there are also several shops, supermarkets, and a gas station for any needs you have. 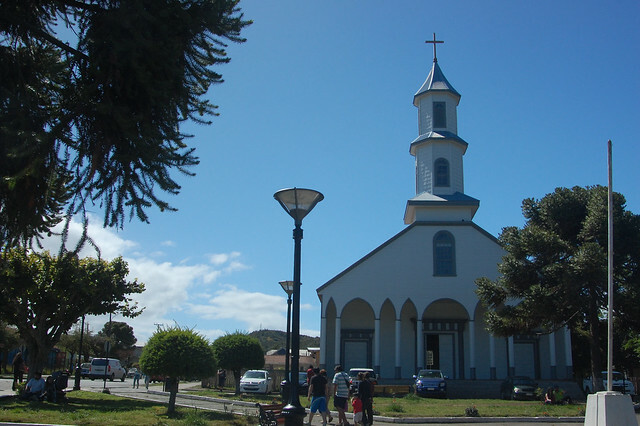 From Dalcahue, many people take the ferry over to the nearby island of Quinchao to visit Curaco de Vélez, Achao, and Quinchao, especially to see the church in Achao. 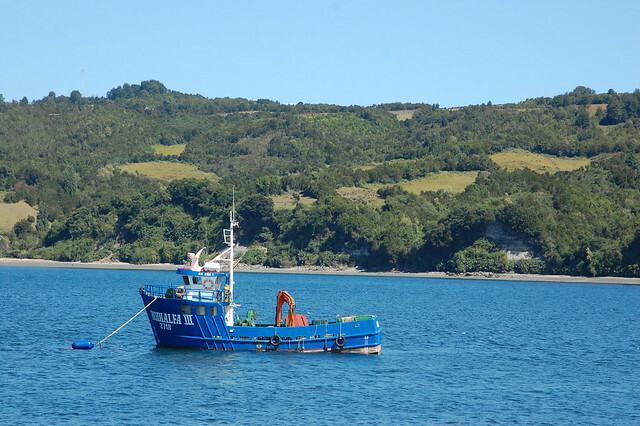 Since I’d traveled from Ancud to Castro earlier that day, I arrived in Dalcahue during the late afternoon and didn’t think I had enough time, but I suggest making coupling your visit to Dalcahue with the hop over to the island in order to get a broader perspective on life in Chiloé. In the public imagination, the island of Chiloé is known for several specific things: its moody clouds that cloak the islands throughout the majority of the year; the beautiful, brightly painted wooden churches located in towns throughout the island; the fishing boats located in every port whose fishermen catch seafood for Chiloé’s famous cuisine; and palafitos, or houses built on stilts. While the fascinating mythology of Chiloé and the natural wonders in its countryside drew me to the island, I have to admit that I really wanted to see the colorful palafitos too. 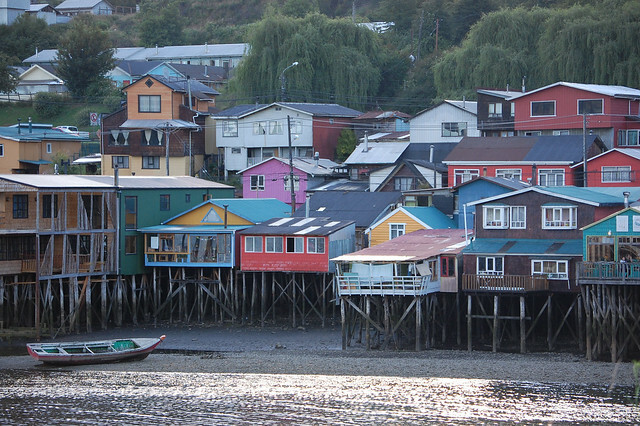 Castro is the capital of Chiloé and its most cosmopolitan, or should I say commercial, city. 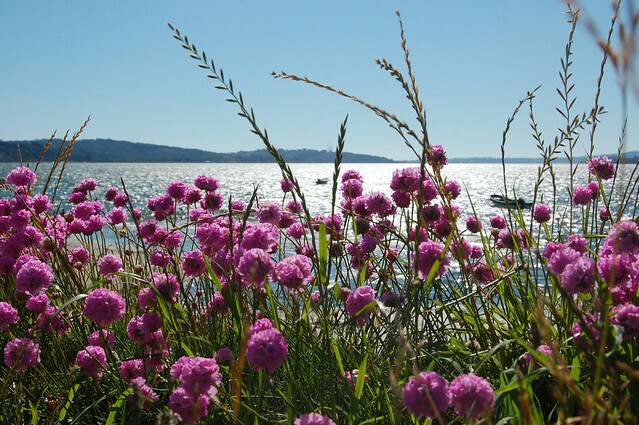 Located an hour or two from the ferry that drops you off on the island, it is the most popular destination for tourists as it provides a central location to travel by bus to many of the other interesting towns on the island, as well as Chiloé’s national park. After spending a couple of days appreciating Ancud and nearby Puñihuil, I headed to Castro to continue my exploration of the island. Due to my fascination with the palafitos, I decided to stay in one of the many palafitos now outfitted as trendy hostels in the Distrito de Gamboa (Gamboa District). Just a short walk down a long, steep hill from central Castro, this route provided me with my first, and arguably the best, views of the palafitos. 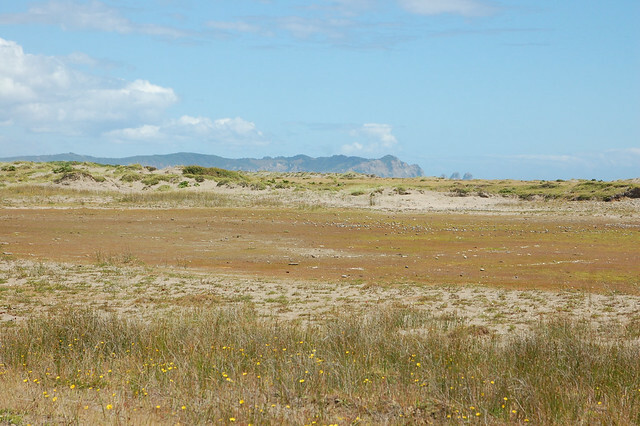 When I arrived, it was afternoon and the tide was out, allowing me to see the palafitos rising up from sea level. As I arrived on a Sunday, I knew I wanted to quickly check-in to my hostel before heading to the weekly artisan market in nearby Dalcahue. On my way to the bus terminal, I knew I had to get a sense of Castro proper, so I decided to walk to the Plaza de Armas, the main square located in the heart of Castro’s commercial district. Of course, I had to check out Castro’s Iglesia de San Francisco, one of Chiloé’s UNESCO-protected wooden churches. 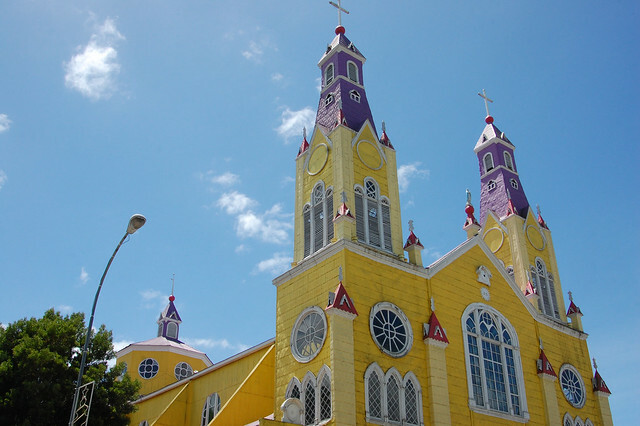 While the canary colored church looks as majestic as a cathedral, especially when seen from the side, it is actually not officially a cathedral (that distinction goes to the cathedral in Ancud). I loved the bright yellow paint coupled with royal purple towers. Castro’s Plaza de Armas is one of the prime attractions in the city, with wide pathways designed for strolling and plenty of seating options, especially on sunny days like those I was blessed with on my visit. As in many cities in South America, the Plaza de Armas is one of the busiest places in the city, and a perfect place to people watch. 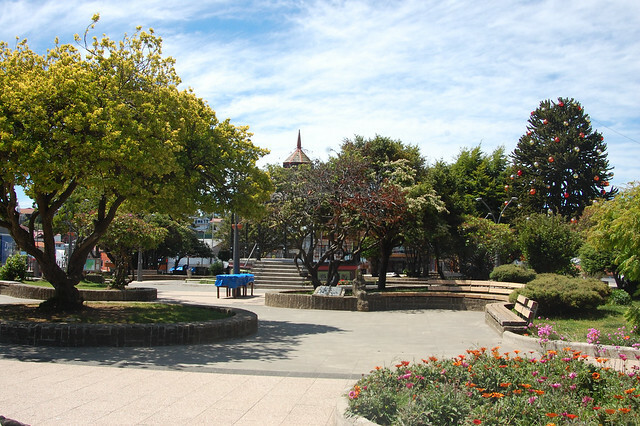 While the rest of Castro’s streets are crowded with pedestrians and traffic, the Plaza de Armas provides a little tranquility. After returning from Dalcahue, I headed down to Calle Eusebio Lillo, which is home to several hostales, restaurants, and Castro’s markets, a good place to buy both artisan goods from Chiloé as well as local foods, including Chiloé’s delicious potatoes and seaweed (yes, it’s delicious too!). Although I didn’t visit at mealtime, I heard rave reviews about Restaurant Travesía from a professional chef I met in Ancud, located in this district. After checking out the markets, I headed over to the harbor to watch the fishing boats. This is also where you can hop on a boat and take a tour of the palafitos in this district, which are only visible from the water. Although I opted not to take the tour, I’m sure the views would have been beautiful! Next time! While Castro has some unique aspects (such as the aforementioned palafitos), I found it to be a pretty standard commercial city, much like La Serena, near where I lived in northern Chile. Since I had already fallen hard for Ancud, Castro couldn’t quite capture my heart. 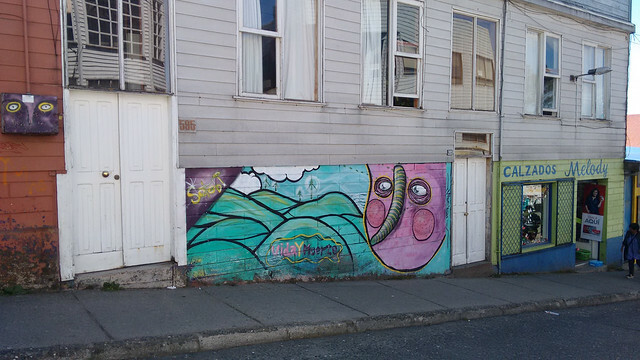 That said, I liked how its street art celebrated Castro’s unique urban landscape, like this mural of the palafitos. 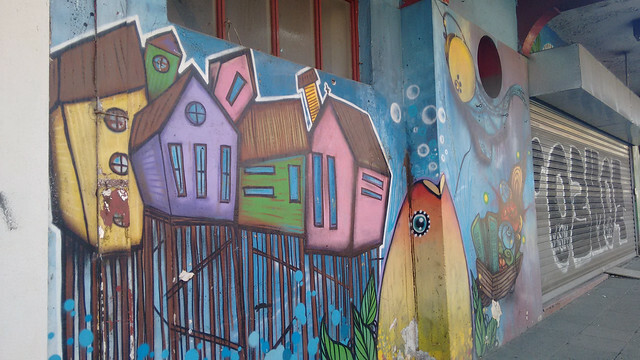 It reminded me of Valparaíso’s art depicting the city’s colorful hills. For that reason, I decided to spend most of my time appreciating the views over the water as seen from the palafito I stayed in. While the sunset provided nice views of the rosy clouds, I was in for a special treat the next morning. On my second day in Castro, I woke up early and noticed these amazing rainclouds over the water. In case you’re new to my site, I’m obsessed with clouds (especially when they reveal blue skies hiding behind!). The calm waters provided perfect mirror-like reflections of the many shades of grey, which were accurate predictors of the downpours I got caught in later that morning! Always in search of new perspectives on the city I’m visiting, I wandered down the long route by the water, heading downhill to the palafitos on Gamboa. At the top, I spotted this mural with a very important message for Chilotes, encouraging youth to define themselves and their relationship with the world, instead of only letting the messages come from outside. From there, there is a gentle walk down the hill, providing great views of the palafitos and a much calmer, quieter route from the center of town. This was a good way to appreciate Castro’s charm. Yes, the palafitos are just as picturesque as the pictures suggest, and I do recommend staying in one if you don’t mind spending a little extra cash for the experience. For a day or two, it’s worth it to wake up to these lovely views over the water. On my last day in Castro, I was greeted with clear blue skies, which is how I got the picture that leads this post. I also enjoyed sitting outside in the morning sun and watching the birds playing on the palafitos. 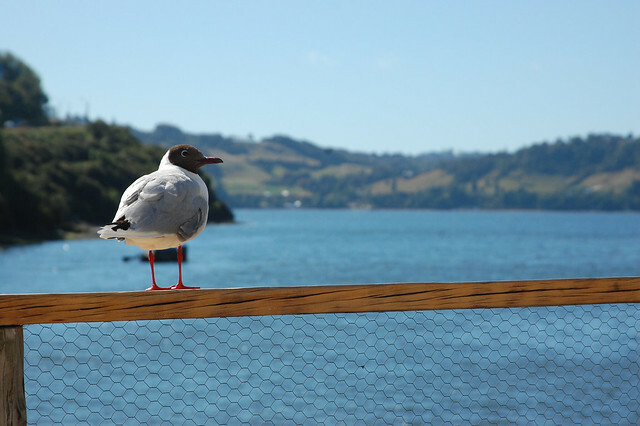 If I’d had more time before continuing my journey, this would have been a perfect day to spend enjoying a leisurely lunch in one of the cafés located in the palafitos, so I suggest giving yourself a few hours to enjoy the laid-back pace on the island of Chiloé! As I mention above, most tourists base themselves out of Castro, although I was partial to Ancud. 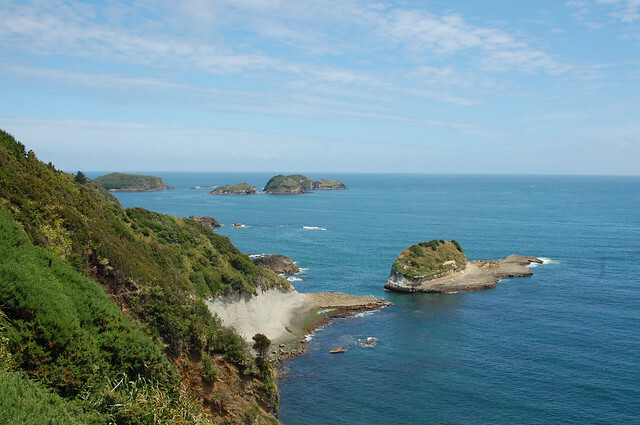 If you have enough time in your itinerary, I recommend dividing your stay between Ancud and Castro, as they give you access to different parts of the island. There are lots of small towns you can visit, especially if you rent a car (highly recommended for those with a more generous travel budget). I stayed at one of the many luxury hostels located in the Gamboa district and would recommend you do the same if you are interested in having easy access to views of the palafitos. That said, I traveled in January (South American summer) and ended up in a cramped dorm room that I think is only really used in the really busy season. All of the hostels offer more or less the same prices and breakfasts so I would do a little research before settling on one of them. There are also many more affordable hostales located in the center of Castro, so that is another option. I ended up self-catering from the market during my stay, but Restaurant Travesía came highly recommended, and I really wanted to visit Café del Puente after reading this blog post (in Spanish). Castro’s main tourist attractions are its lovely Plaza de Armas including the Iglesia de San Francisco, the markets located on Eusebio Lillo, and the boat tour of the palafitos. If you like shopping for unique clothing and other goods, there are several neat boutiques on Blanco Encalada. 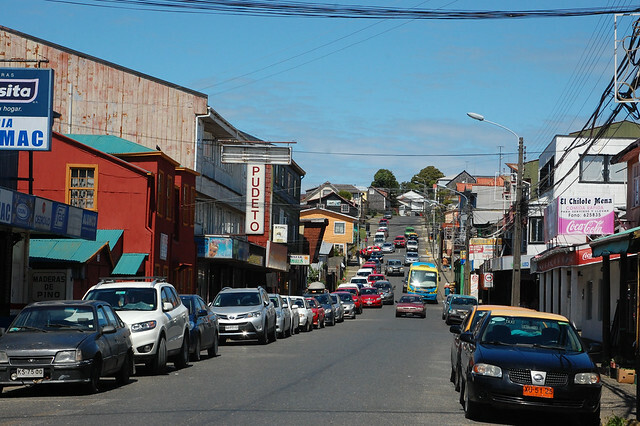 Because of its central location, buses to the rest of Chiloé leave from Castro. 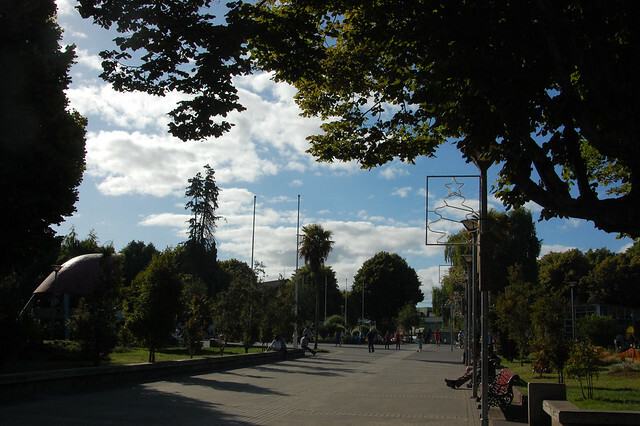 Cruz del Sur buses continue from Ancud to Castro and end in Quellón. 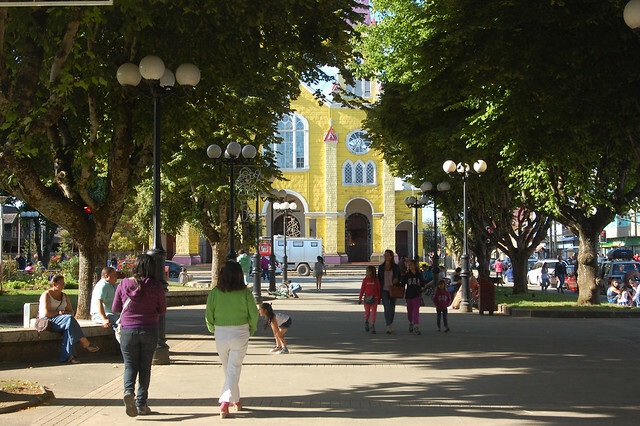 You can also catch buses to Valdivia and Santiago as well as other destinations on Cruz del Sur. 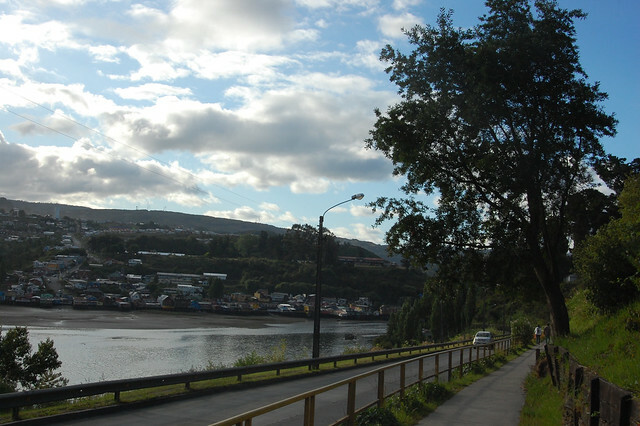 Buses to places like Dalcahue and Cacao (the town located by Parque Nacional Chiloé) leave from the municipal bus terminal, located on San Martín (the Panamerican Highway) between Sargento Aldea and Eleuterio Ramirez. 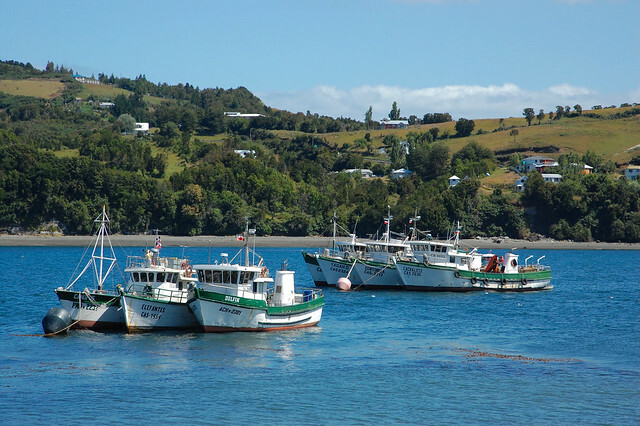 If you’re interested in reading more about increasing tourism to Chiloé, this article is interesting. 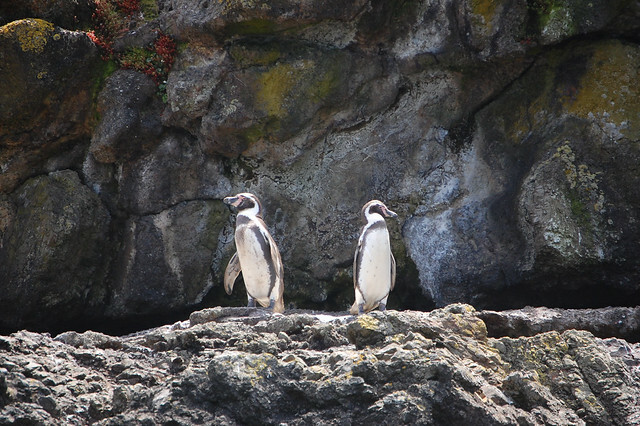 When I decided to visit the island of Chiloé back in January, I knew that I really wanted to visit the penguin colony in Puñihuil. 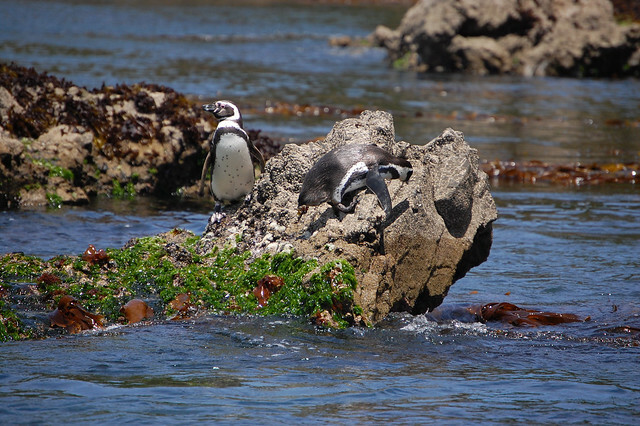 My preliminary trip research had revealed that there was a small colony of Humboldt and Magellanic penguins that breed together on the small islands (islets) just off the coast of Puñihuil. Even better, it was easily accessible from Ancud, making it a lot easier than some of my other trips to see penguins over the years. I woke up early in Ancud to figure out how to get to Puñihuil. I’d read that there were public buses, and my hostel had the bus schedules posted to make things even easier. 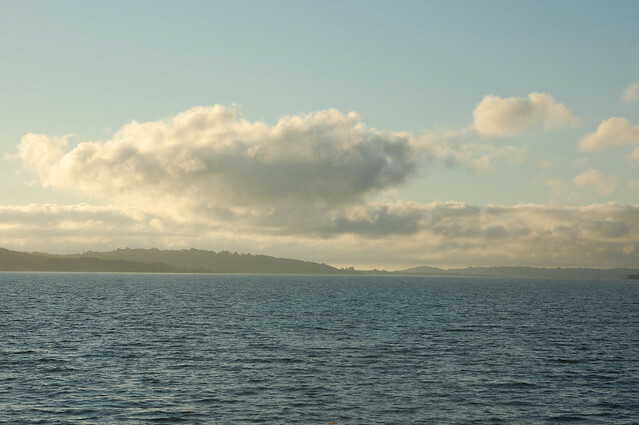 I set out on what seemed to be a grey day, so typical for Chiloé, but to my delight, the clouds cleared away later on, leading to beautiful views throughout the day. As it turns out, the bus I’d hoped to take only runs in high season, which had yet to really start in Chiloé. Since it was a Saturday, my other options were limited. Instead, I could take a tour, so in the interest of keeping things simple, I signed up. As I had similarly discovered during my tour to Parque Nacional Isluga in northern Chile, going with a guide ended up being a very good idea. Before heading to see the penguins, we took a detour to the Mirador Cabeza de Vaca, a road that leads up a dirt road towards the top of a hill. 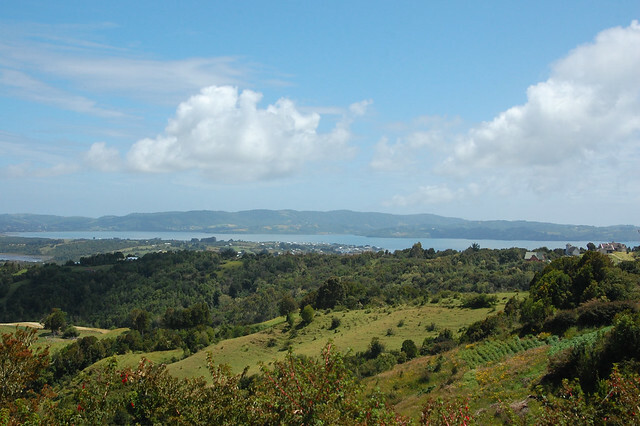 From here, you can see the ocean on a clear day and appreciate the gorgeous green hills of Chiloé’s rich farmland. I was completely smitten. 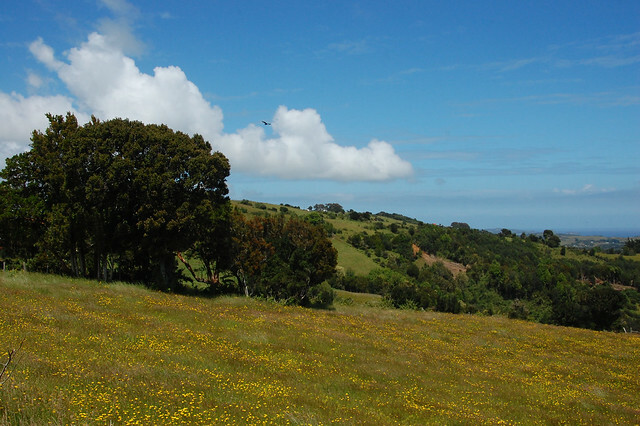 I had been curious about Chiloé rural landscapes, and without even expecting it, I was surrounded by green farmlands brightened up by summer wildflowers. As it turns out, this area is called Cabeza de Vaca due to the shape formed by the land – it looks like a cow’s head, apparently. Whatever the reason for the name, I appreciated the chance to take in the landscape spreading out all around us. Being able to see the surrounding land from a high vantage point helped give me a better idea about what Chiloé is really like. It’s one thing to hang out in an awesome city by the water; it’s quite another to see the fertile island for what it is. 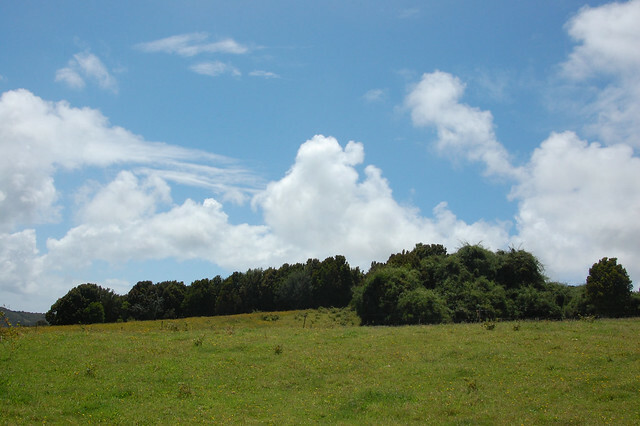 From there, we descended back towards the main road leading towards Puñihuil, back towards the coastline. With the sun now breaking through the clouds, we were able to appreciate the turquoise blue of the ocean. The views from Mirador Piedra Run gave me a great perspective on the cliffs leading down to the beach. Look at how green the foliage is! After living in the desert for so long, I was used to beige cliffs covered in dirt, not these luscious green ones. 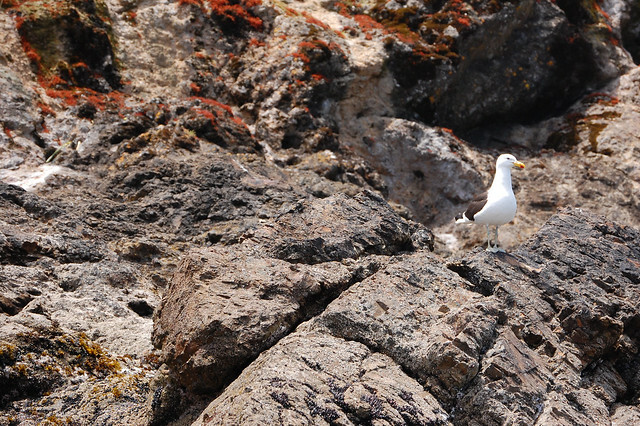 According to our guide, there are many stories that speculate about this rock sitting all by itself on the coastline. Perhaps it conceals treasure? 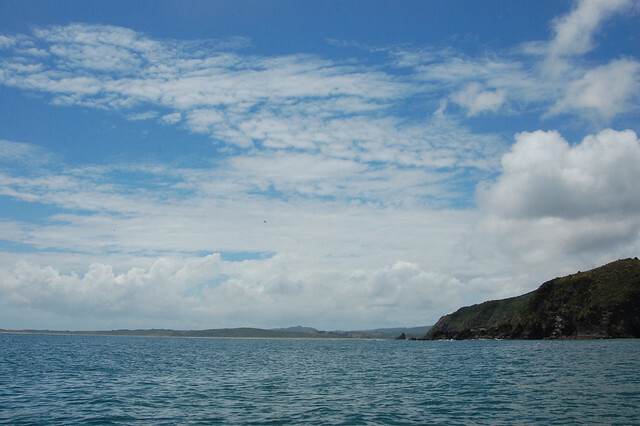 As we continued our approach to Puñihuil, the ocean turned a magnificent shade of turquoise blue. I almost can’t believe that this color is real! 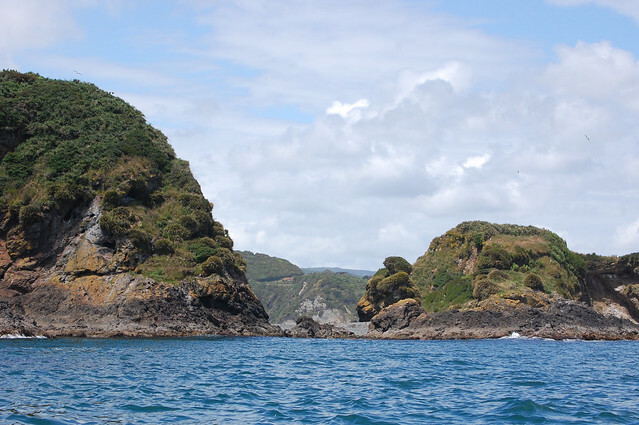 Unspoiled coastline and beautiful views over the water. Amazing. After a pleasant drive with many lovely views, we arrived at Puñihuil. 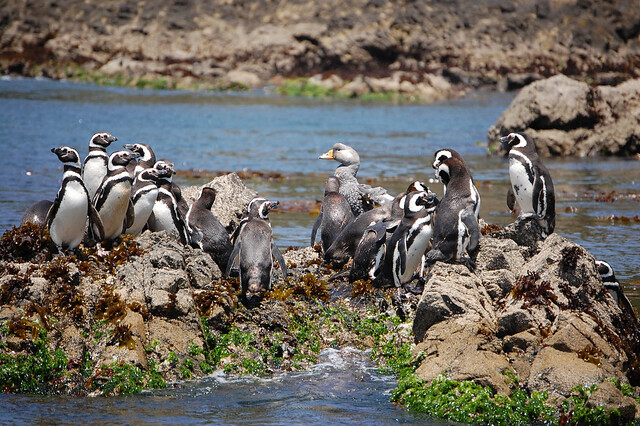 Puñihuil is a tiny set of buildings built right along the coastline, including several businesses offering boat tours to see the penguins and their accompanying restaurants to feed you when you’re done. After putting on our life preservers, we boarded a little cart and were pushed out to the boat, avoiding getting our feet we. And then we were off, heading away from shore towards the penguin colonies. It was nice to see the expanses of turquoise all around me. 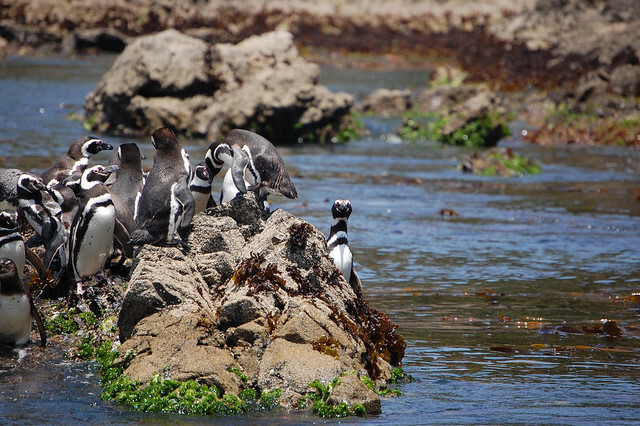 Due to the popularity of the penguin colonies and the need to protect their habitats, there are now strict regulations on how closely boats can approach the rocky islands that the penguins and other birds have made their homes. Bring a zoom lens! For once, I had remembered to bring mine, which is how I got these up close shots of the penguins. So adorable! I love them. We floated near the penguin colonies, just watching them be their adorable, goofy selves. What’s that grey guy doing there? Is he a young penguin or just a visiting seabird? This penguin was looking right at us! Probably tired of seeing so many tourists pass by his house. After approaching the penguins on the tinier islands, we headed around to the other islands, where the penguins had more space to walk around and do their thing. After checking out the penguins, the boat turned around gave us a chance to appreciate the coastline from the vantage point of the ocean. Look at that beautiful coastline! As you can see, Puñihuil is just a small grouping of buildings along the beach, which have sprung up to meet the needs of the tourists. 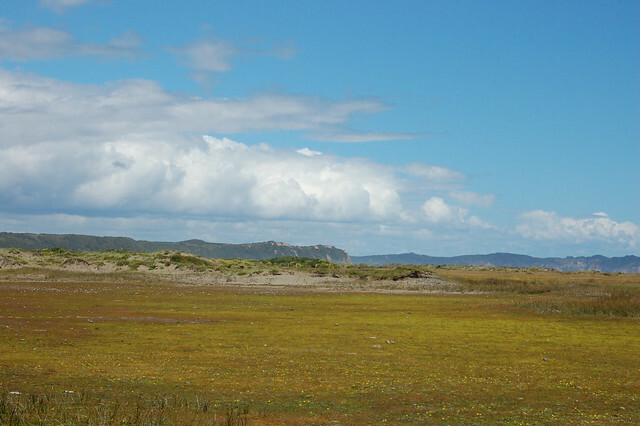 CONAF, Chile’s national park service, operates from here as well, protecting the interests of the wildlife. And after a pleasant spin around the penguin colonies, we were back to the beach, just in time for lunch. While my tour companions headed off to lunch, I decided to wander up and down the beach, seeing what else the little outpost had to offer. Since the summer season was about to take off in full force, there were a couple of artisans selling their wares on the beach. As it turns out, there is also a trail run by CONAF that takes you up the cliff to get some great views of Puñihuil, if you have time to climb up there. On the way back, I sat in the front of the van next to our tour guide, who began to tell me stories of real life in Chiloé, rather than the version often sold to tourists. As I’ve mentioned, Chiloé has always been a world apart from the rest of Chile, a island community dedicated to agriculture and fishing. He had grown up in the farmlands without much money, without even shoes to wear to school, and this was a very common story. After working hard in school, and with support of a relative, he finally moved to Ancud where he studied and eventually learned to drive, which over the years led him into guiding tours (very commonly in Chile tour guides do double duty as the van/bus drivers). One day, he led a group on a tour – and one of the tourists happened to be a schoolmate who remembered him from those days when he didn’t always have enough food to eat at lunch. The two marveled about how far they had come from those days. But as he told me the story, his face grew dark, for all the same reasons that Chiloé is currently in crisis. With the only access off the island limited to taking a bus ride or a very expensive ferry trip with a car, the costs of basic goods remains very high, with many people only earning minimum wage. He was all for the plans to construct the bridge and make it easier for normal people to drive to Puerto Montt to buy what they needed, instead of having to pay excessive markups on products brought in by others, or having to miss a full day of work to shop on the mainland. It makes me sad to think how the red tide has probably affected Puñihuil, which was so vibrant and full of ocean life on my visit. I am glad I got a chance to see part of what makes Chiloé so special on my visit, and I hope this crisis brings change to Chiloé. Although there are a few public bus options to get to Puñihuil, especially during the summer season, I was actually really happy that I took a tour to Puñihuil for two reasons: the tour includes the drive through Cabeza de Vaca, where I saw the gorgeous farming landscape, and because I had an excellent conversation with my tour guide on the drive back, where he really helped me understand the reality of life on Chiloé. I went on the tour with Chiloé Viajes, and it cost $15000 CLP in January 2016. For this reason, if you decide to take a tour, make sure to ask if the tour involves a trip to Mirador Cabeza de Vaca and Mirador Piedra Run on the way to Puñihuil. 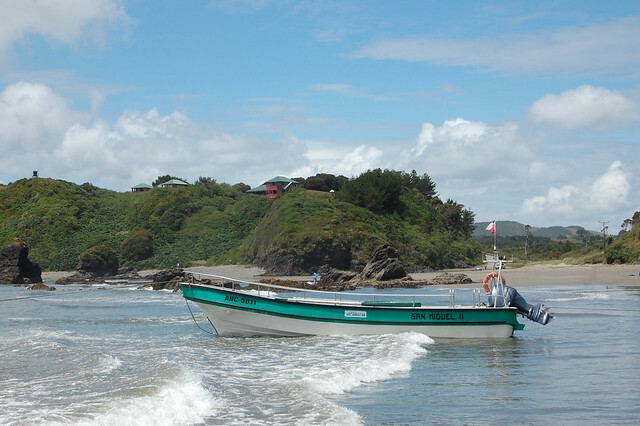 There are several different tourism groups in Puñihuil – each tour company takes you to their preferred boat company and recommends their preferred restaurant. If you drive there yourself, you have several options, and each of them include free parking. I’m pretty sure all of the boat tours are the same, due to the regulations governing the penguins’ habitat. The other advantage of finding your own transportation or driving is that you’ll have time to walk around the Monumento Natural Islotes de Puñihuil, which has a trail to a viewpoint operated by CONAF, the Chilean parks service. I skipped eating lunch at the restaurant and wandered around a bit, but didn’t realize that the trail would have been worth my time until I saw pictures later. 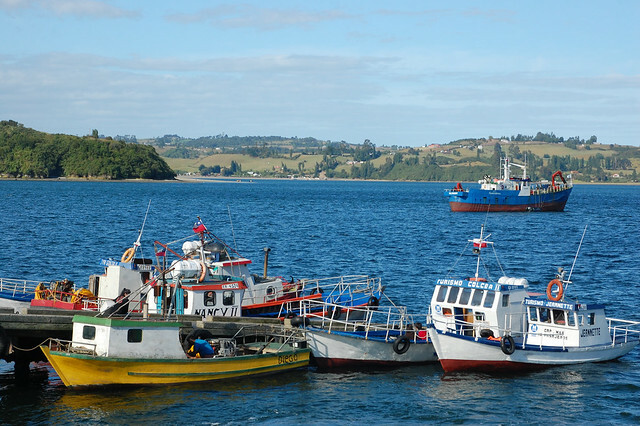 Because of the prohibition on fishing due to potential illness, the island of Chiloé is suffering a major financial crisis. The government initially offered $100000CLP, or about $150 USD, per family to help them get through the crisis, a low amount which caused outrage among Chilotes. 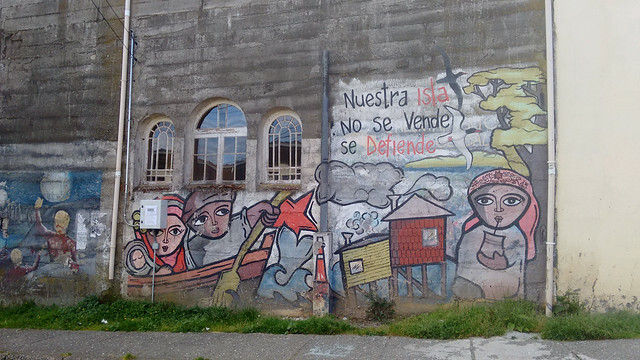 Protests have escalated throughout the region – fishermen blocked the major highways leading to Chiloé, isolating the island from the mainland; meanwhile, additional solidarity protests have occurred throughout the country. 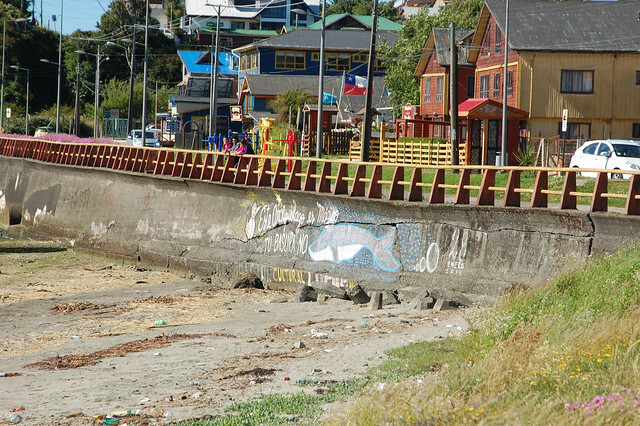 As a result, the Chilean government is working towards a solution, increasing the amount of financial support provided to families affected by the fishing ban, as well as appointing a new regional coordinator, who has signed agreements with different comunas (or counties) of Chiloé to end the roadblocks and protests. This situation is much more complex than I understand or can state here. There are rumors of secret deals with the salmon fishing industry; there is a history of government neglect of the island of Chiloé for generations. But everything that is happening now is in line with what I was told by the Chilotes themselves during my visit back in January. Geographically and financially isolated from mainland Chile, Chilotes have developed their own culture and their own way of life. 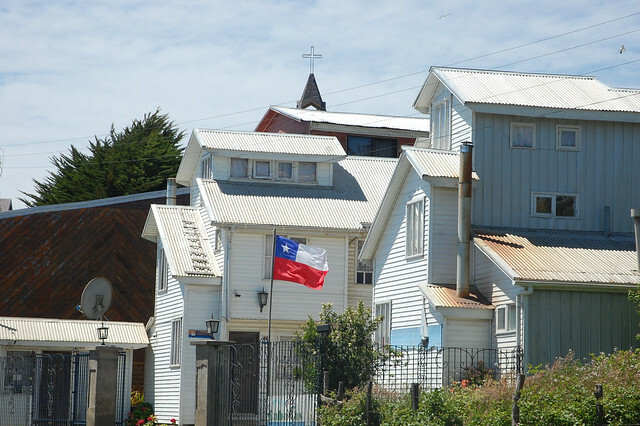 As this article states, Chiloé is not a financial powerhouse, but its culture factors strongly in how the Chilean nation sees itself. 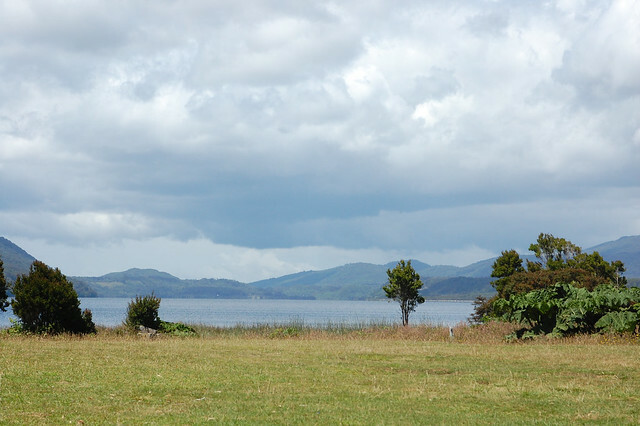 The people of Chiloé dream of an improved quality of life for themselves and especially their children, They want to earn a more sustainable living wage. They want support from their government to connect it with the mainland; they want the much promised bridge over the canal rather than an expensive, slow ferry. 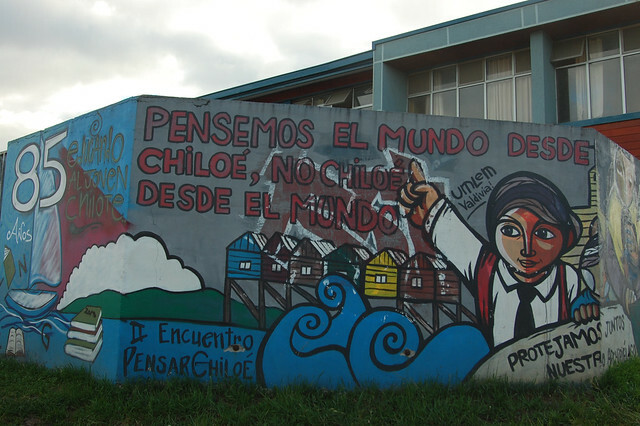 And to an outsider like myself, that’s the root of the protests: Chiloé matters. The Chilotes matter. 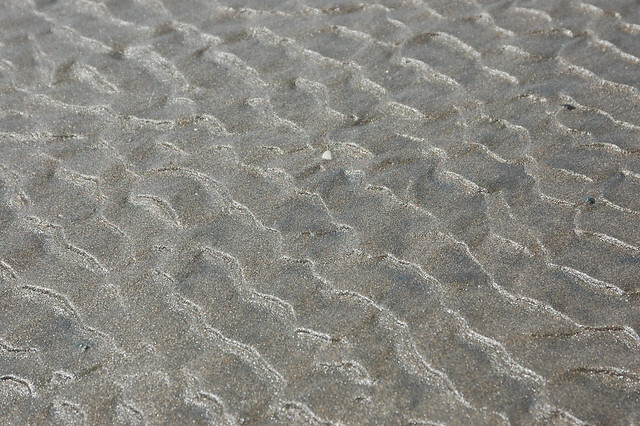 And what happens to the ocean surrounding the archipelago absolutely matters too. 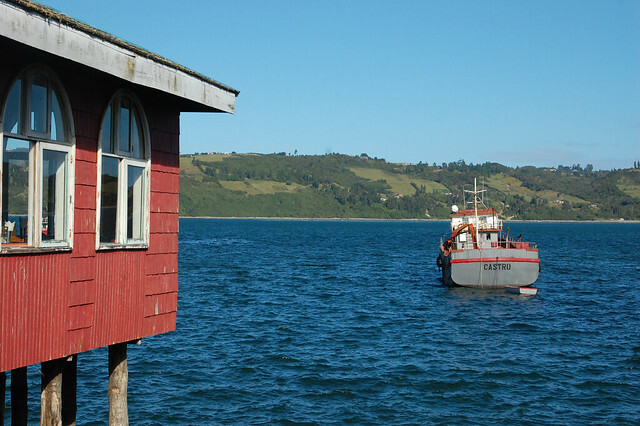 I visited Chiloé because of the picture that was always painted for me in guidebooks, when talking to Chileans from other regions, and in photo essays online. Chiloé is a mystical island which is almost a world apart from the rest of Chile, with its own unique culture and history. After my short visit, I definitely deepened my understanding of the region, but I only scratched the surface of the island’s unique character. I hope my next few posts encourage you to visit the region, which needs visitors investing their money into tourism, especially if the fishing industry remains paralyzed for a while. 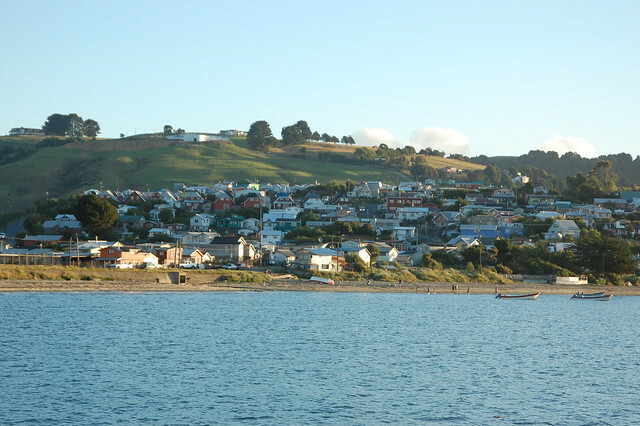 My trip to Chiloé started in Ancud, the fishing port and and first major city on the Isla Grande de Chiloé. Fair warning: This post is LONG and filled with photos! 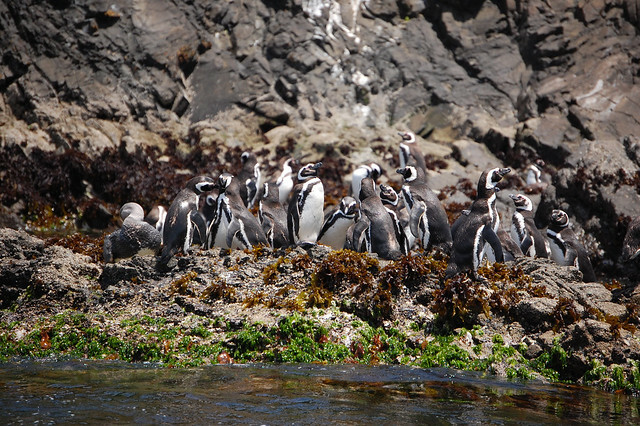 I wanted to do Ancud justice – most people only pass through briefly en route to the penguin colony in Puñihuil or on their way to Castro. 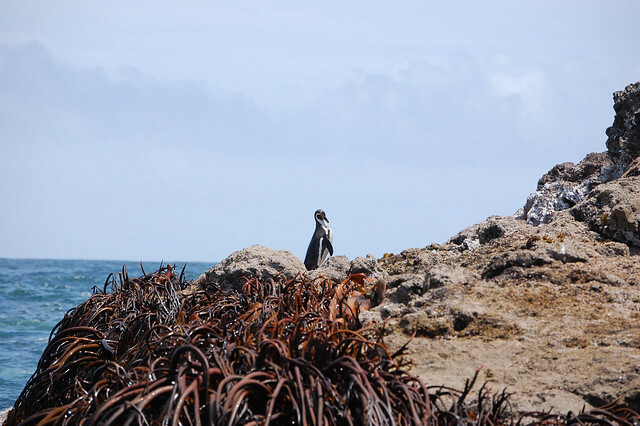 Ancud is awesome and my goal with this post is to encourage you to spend more time there! 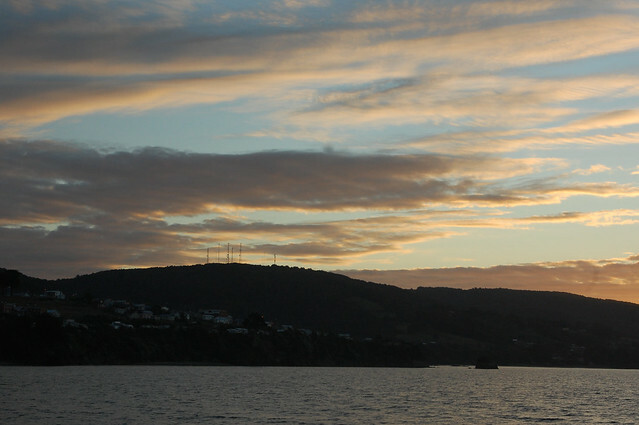 As I’ve mentioned in other posts, visiting Chiloé was a travel dream come true. 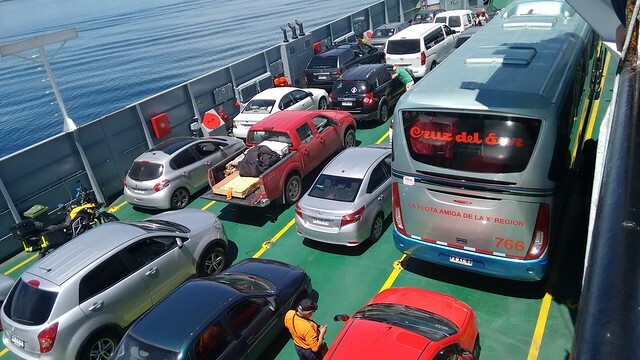 After thoroughly enjoying my explorations around Pucón and Puerto Varas, I was excited to get on the ferry to cross over to the island of Chiloé on January 1, just a few short months ago. After celebrating New Year’s Eve until the wee hours with an international cast of characters from the hostel in Puerto Varas, my new friend Marilene and I boarded our bus to Chiloé, sneaking moments to sleep when we could. When the bus boarded the ferry, we all filed off the bus and headed to the open air levels of the ferry to take a look at the views. Like my fellow tourists, I was excited to see the expanses of blue all around us. After so much bus travel, there is something special about crossing the Canal Chacao on a boat and being able to appreciate the snow-covered mountains and volcanoes off in the distance. 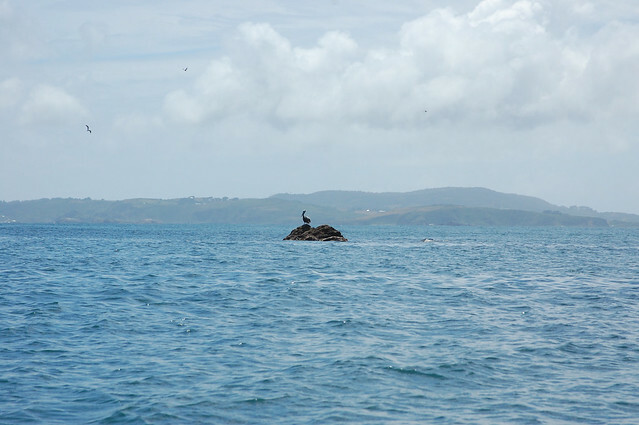 …and even sea lions making an appearance and swimming alongside the boat on my return trip a few days later. 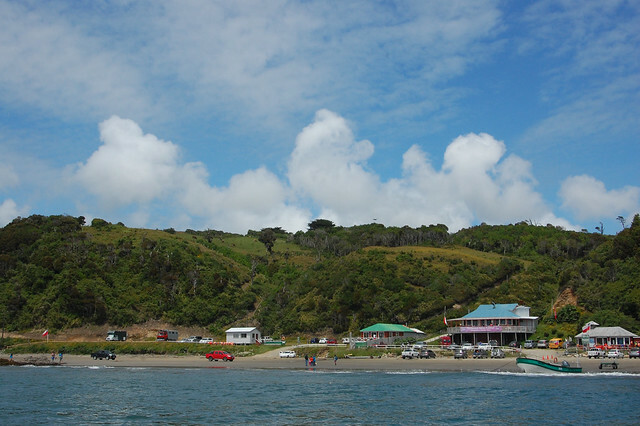 The trip on the ferry takes about 30 minutes, enough time to stretch your legs before boarding the bus once again for the trip to Ancud and the rest of the island. 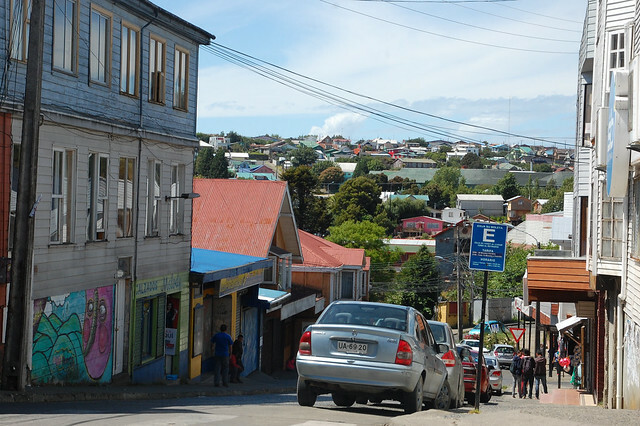 As I mentioned earlier, we arrived to Ancud on New Year’s Day, a national holiday, so the city was even quieter than usual. This gave me a chance to really take in Ancud’s atmosphere and laid back vibe. 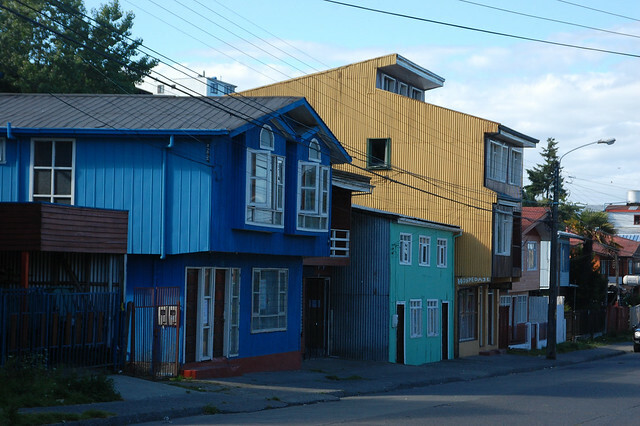 Although Ancud is a small city, the first thing I noticed upon arrival is how hilly it is, with colorful wooden houses built into gentle slopes. Perhaps this is why it seems to have a small town atmosphere, even during the busier work week. 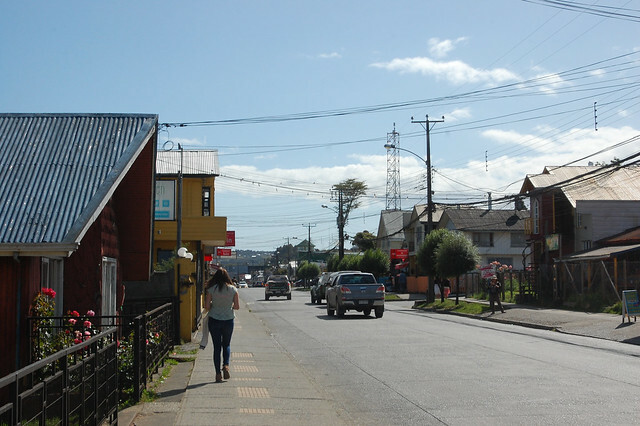 The other thing I noticed is that Ancud is an incredibly walkable city, especially for tourists. 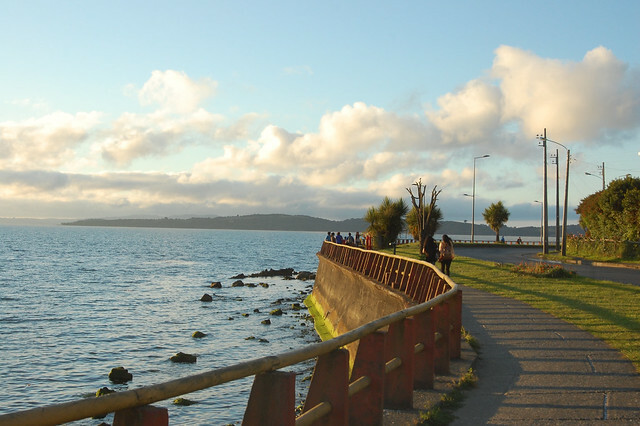 Most of the hostales are located within a few blocks of the costanera, or beachfront walkway, and also within walking distance of the Cruz del Sur terminal in Ancud. (Cruz del Sur is the major bus company that serves the island of Chiloé and other parts of southern Chile.) 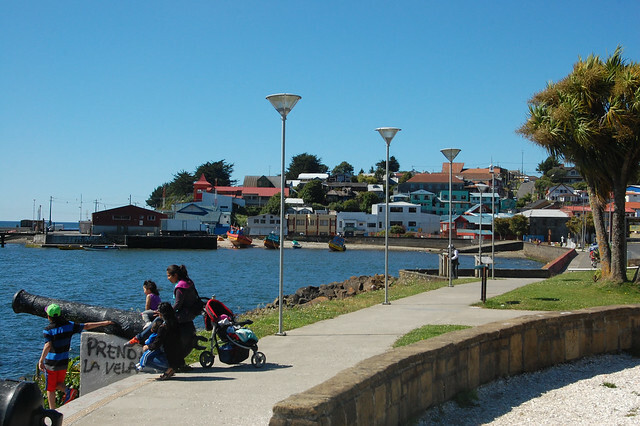 For arriving visitors, this means that your first impression of Ancud probably will involve walking right towards the water. 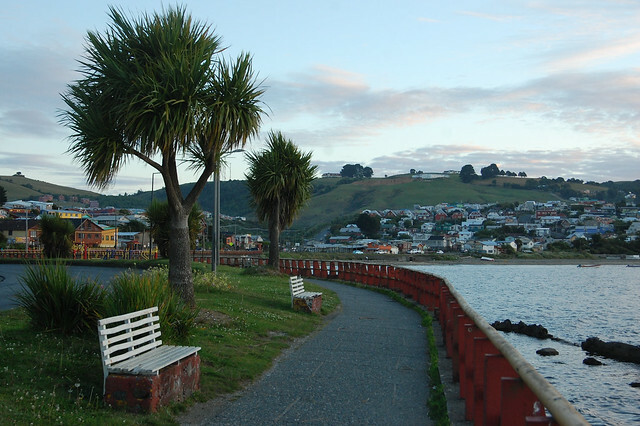 Arriving in Chiloé by bus, you end up right in the middle of the costanera, so you can either head to the center of town or to the beach. 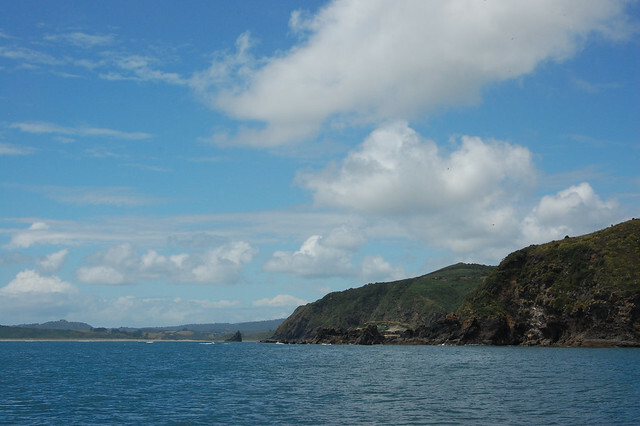 I was lucky to have very good weather for most of my time in Chiloé, which meant that the skies were a brilliant blue and the ocean almost equally as aquamarine along the coastline. 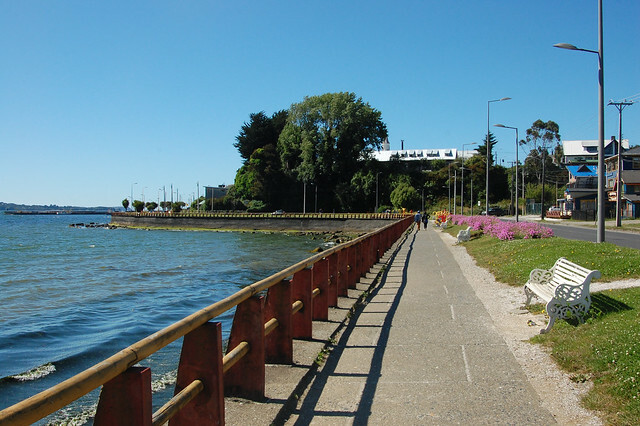 For this reason, I was more than happy to walk along the costanera in the sunshine towards the center of Ancud. 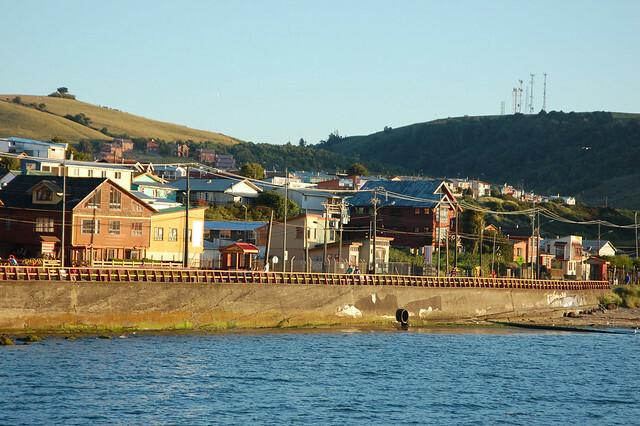 While there are houses lining the costanera, like those pictured above, there is also a sense of openness, with the city located up on the hills instead of right on the water. 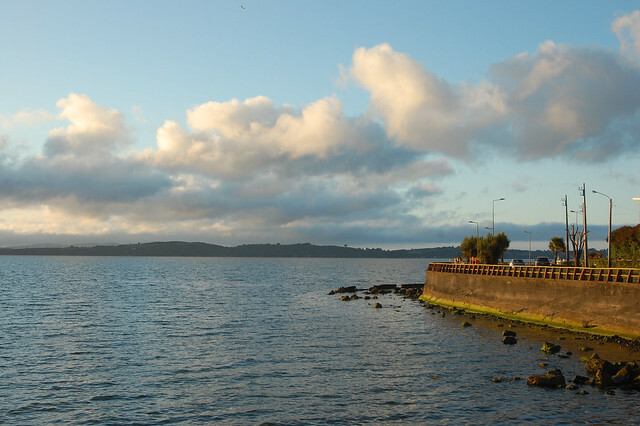 Walking the costanera, you come across several different remnants of Ancud’s history as a Spanish stronghold a few centuries ago. 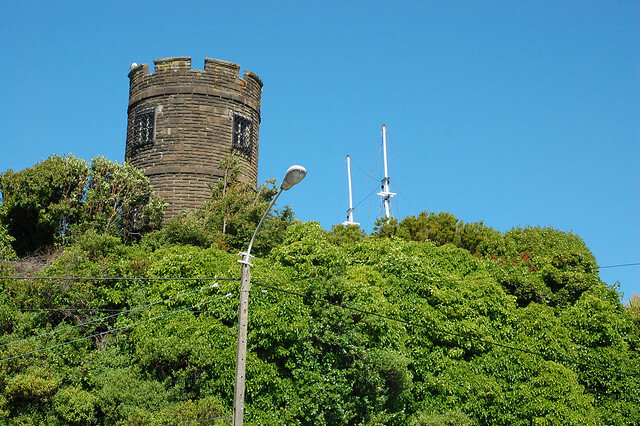 There are a couple of forts you can visit in Ancud with great views over the water, as well as the tower you see above, now part of the Museo Regional de Ancud. The costanera also hosts a monument to the battles of past eras, with these colonial cannons looking out over the water. Kids love to play on them, of course, just as I did so many years ago. In most cities in South America, the Plaza de Armas is the best place to start wandering around a new city, exploring the side streets and seeing where you end up. 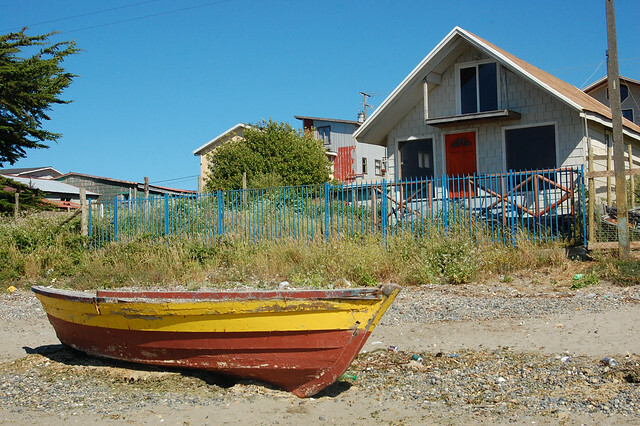 It’s hard to describe the appeal of Ancud, but I hope these photos capture it. 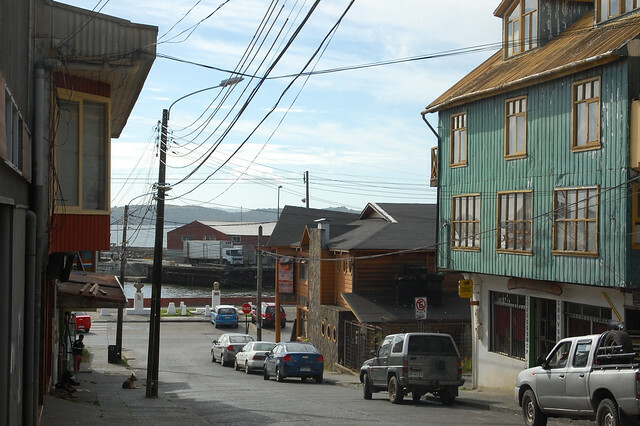 I think the reason I liked Ancud so much is that it just exists; it’s a city where people go about their business and their lives. The buildings are brightly colored and interesting, many of them reconstructions after the 1960 earthquake. They are unpretentious, yet still have character and uniqueness. Walking through the streets also gives you a great perspective on how residential the city is, with houses stretching out over the green hills of the region. It’s possible to spend hours wandering through the streets of Ancud looking at all the small family owned and operated businesses all around the city, stopping in to small restaurants and bakeries to try the food from Chiloé. 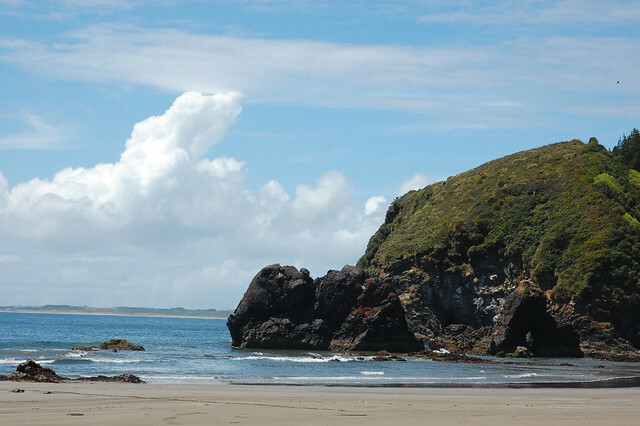 Because Chiloé is actually known for its rainy weather and misty clouds almost always surrounding the archipelago, when the blue skies come out it is definitely time to head to the beach and take advantage of the sun. 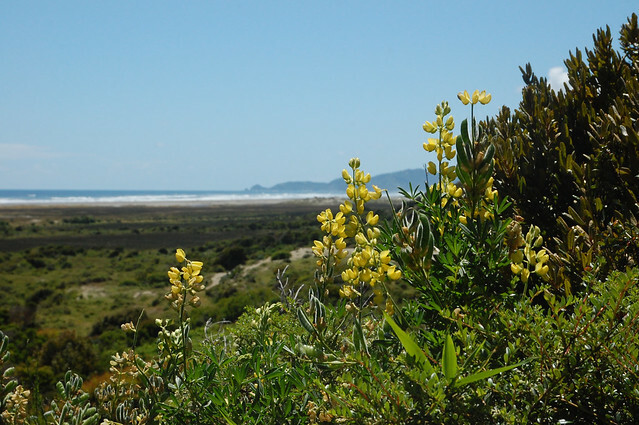 There are actually two areas with beachfront in Ancud; one located closer to the edge of the peninsula north of town near the Costanera Norte, and another located on the way out of town towards Puñihuil, closer to the bus station. That’s where we headed. With such bright sun, the reflections off the water were almost blinding, which led me to take some fun pictures, trying to remember this beautiful day. This would be a good place to bring a book and blanket and just enjoy the sound of the water, a little ways outside the noise and hustle of the city. 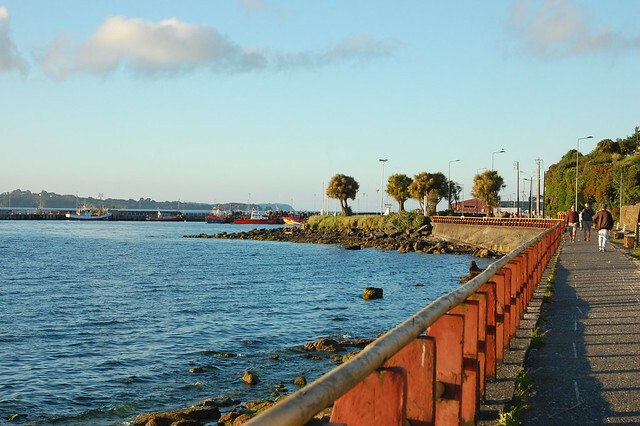 Walking further away from the main part of the beach enables you to get a good view of the colorful houses of Ancud all along the costanera. 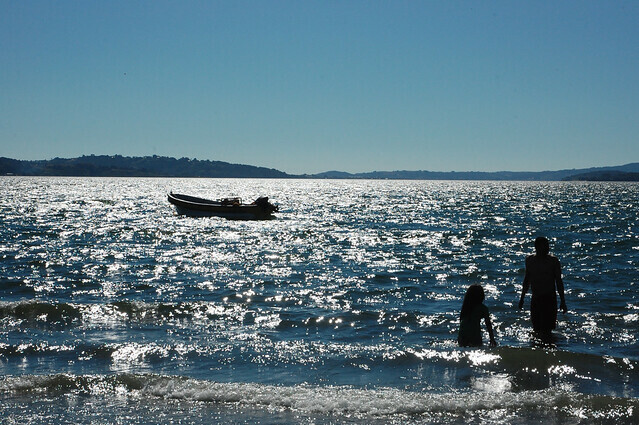 Yes, there’s something special about being on the water in Chiloé, a feeling that was heightened when I visited the beach in Cucao. 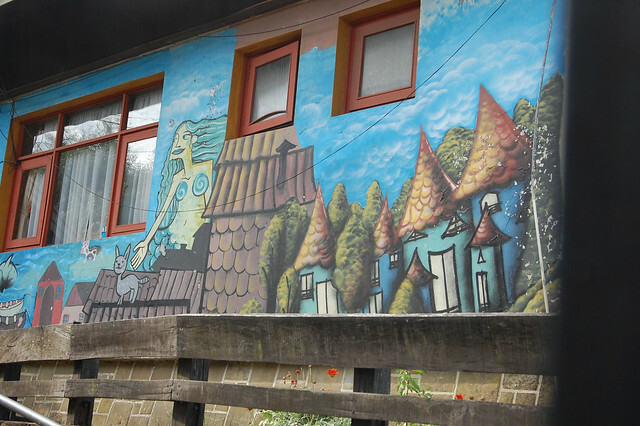 This mural indicates the mystical, mythical intrigue around Chiloé, where people still believe in legends involving creatures and spirits that need to be respected and appeased. (Interesting article on NPR here.) There is so much to learn about this side of Chiloé that I bought a couple of short, locally published books on the subject! 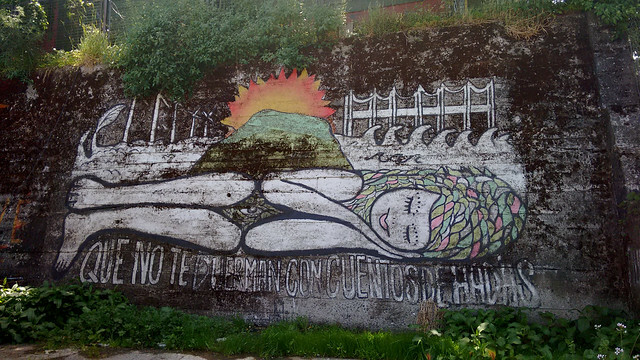 I think this mural represents the rolling green hills of Chiloé, which are the main source of survival for so many Chilotes who live in the rural areas of the island. And this one seems to represent the connection with the ocean, with the fishing boats off to the side, a mermaid, perhaps a spirit, and the houses that line the waterfront as well as the trees all over the island. Finally, this mural by the beach reminds people not to throw their garbage into the area by the beach, as this will just be carried out to the sea, contaminating the waters that give the islands their magic and life. Pretty fitting considering the current crisis faced by the island. 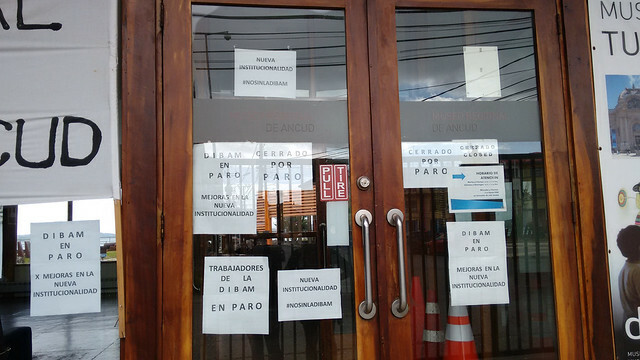 Thankfully, the Centro de Visitantes de Iglesias de Chiloé was still open. 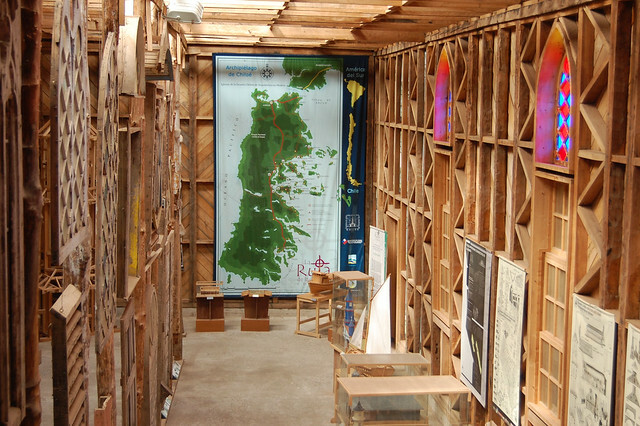 This visitors’ center should be a required first stop for anyone interested in learning more about the wooden churches all around Chiloé, which are protected on UNESCO’s World Heritage List. The Centro de Visitantes is housed in a former convent, the Ex-Convento de la Inmaculada Concepción de Ancud. This building also functioned as the cathedral while the current one was being built. 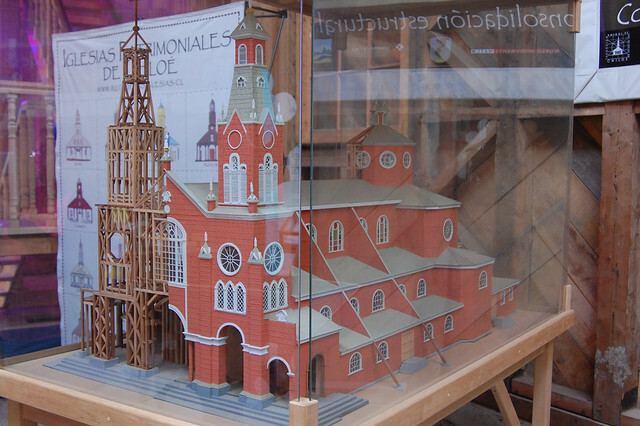 When you visit, make sure to get a guided tour, as this really helps clarify the different techniques used to make the wooden churches. 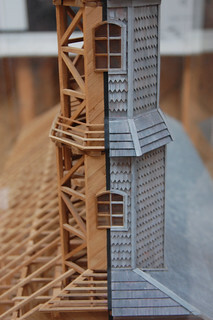 Basically, the wooden churches were constructed using ship-building techniques. 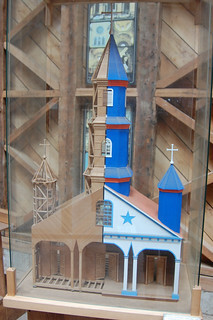 Even if you’re not so interested in churches, it’s pretty interesting to hear all the different types of wood that were used, learn about the different ways to join wood together without nails, and see the many models of the churches around the island, some located in more distant, isolated parts of Chiloé. Knowing that I was not going to have the time nor transportation to get everywhere on the island, I appreciated checking out the models and being able to compare their different types of construction. This is definitely a required first stop for anyone planning to visit the wooden churches of Chiloé. 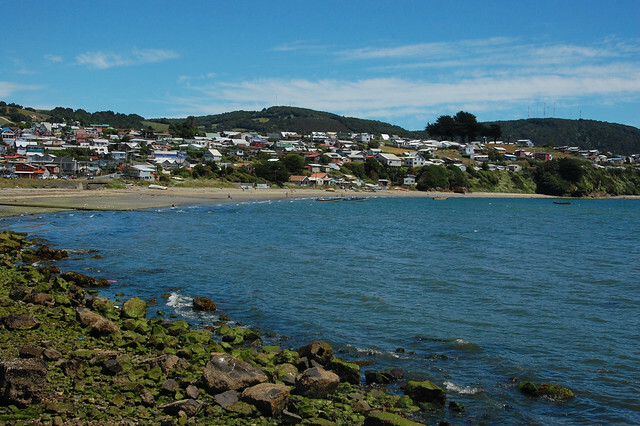 Although the bigger, slightly more cosmopolitan city of Castro gets a lot of the tourist traffic, Ancud is actually a really pleasant place to stay. Most of the hostales catering to foreign and budget travelers are located over by the quieter part of the costanera, including Hostal Nuevo Mundo. 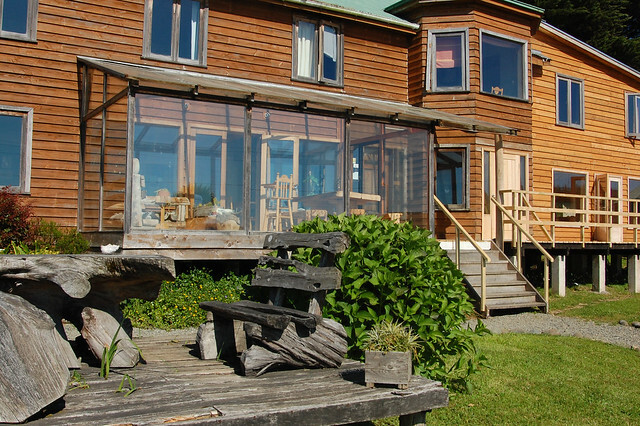 Hostal Nuevo Mundo has dorms and private rooms, many of them with views over the water, and they also have hot tubs for rent, perfect for those cold Chiloé nights. My friend Marilene stayed at 13 Lunas and absolutely loved it – it seemed to be more friendly and upbeat, and also has great views as it’s at the top of a hill. In terms of food, Ancud is known for its giant empanadas, bigger than anywhere else in Chile. On New Year’s Day, the only place open was Restaurant Corita, a charming restaurant with typical cooking from the island. Of course, they had a ton of seafood options, but they also had giant salads to eat with the empanadas. Portions are huge and service is excellent. On my second day in Ancud, I decided to try out Café Bar Nerudiano, a cute café located on the second floor of a shopping gallery, which turns into a bar in the evenings. The space is illuminated by big windows that provide views over downtown Ancud and there is a balcony with seating outside. They served many types of loose leaf tea, and even have jars for you to sniff them. 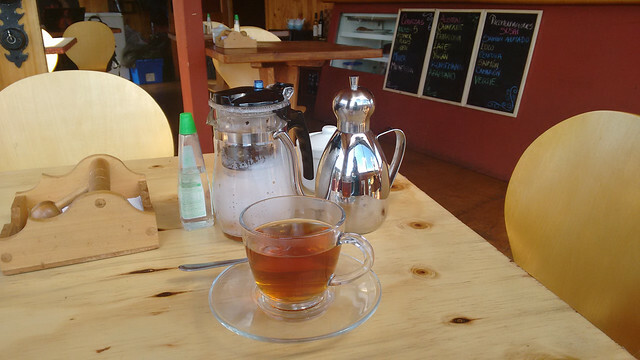 This was probably one of the best places I had tea in all of Chile, even though Chileans are pros at tea. Look at that infuser AND more hot water on the side. 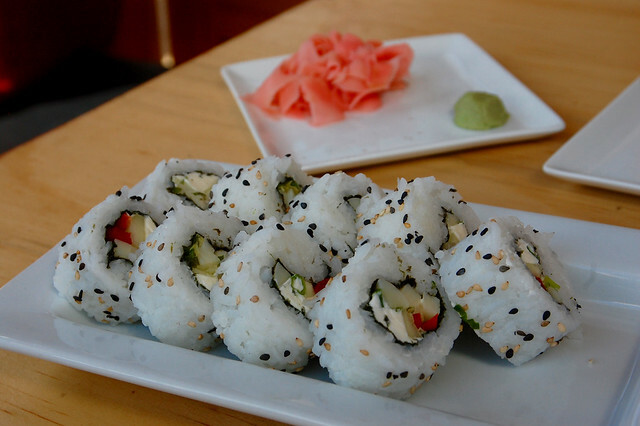 They also serve sushi, including the delicious and filling vegetarian sushi. It definitely struck me as a hangout for young, artistic types – everyone who stopped by seemed to know each other. One of the reasons I stayed in the hostel right on the water in Ancud was to have easy access to the waterfront during the sunset! 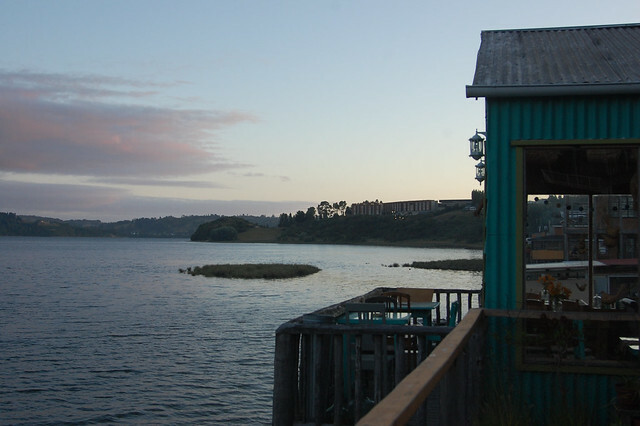 Part of Chiloé’s magic comes from the clouds rolling in over the water as the temperatures change from day to night and night to day. The late afternoon sun illuminated the hillside of Chiloé, making the colorful houses stand out of the landscape like a pastoral painting. And as if on cue, the clouds rolled in over the horizon, guaranteeing a fascinating sunset. This photo gives a good sense of the length of the costanera – a great place to walk or bike, with many people strolling together and watching the sunset. 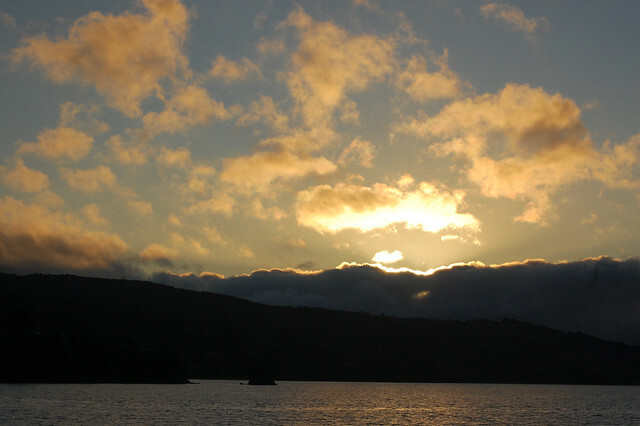 As I watched the skies change, I definitely began to understand the mystique of Chiloé. What can I say, I love a good sunset, and I made sure to go back and watch the next night. The clouds were in a slightly different formation, but still just as beautiful. 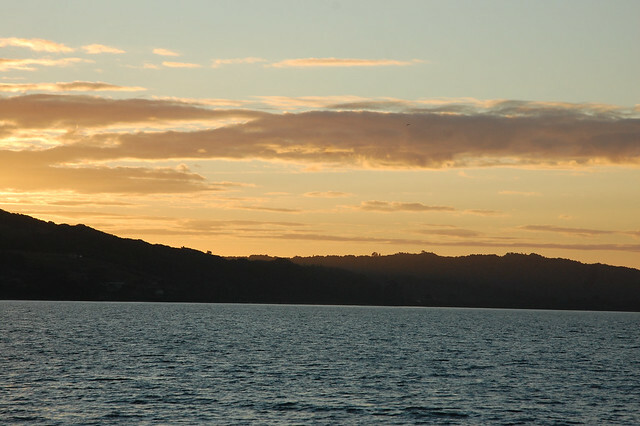 Staying in Ancud was an excellent choice for classic sunset shots. 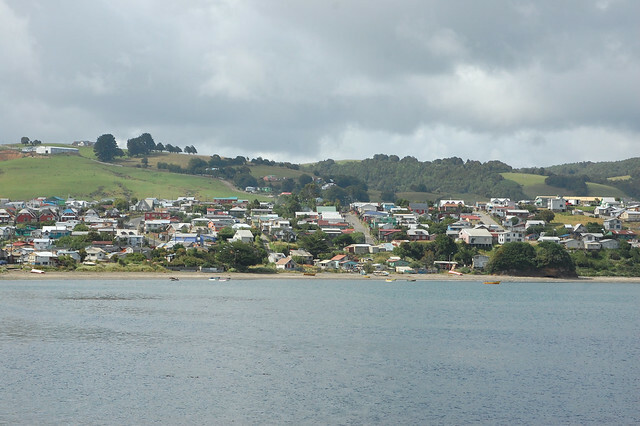 As you can see, Ancud is an appealing city; for me, its low-key vibe provided a perfect introduction to the island of Chiloé. 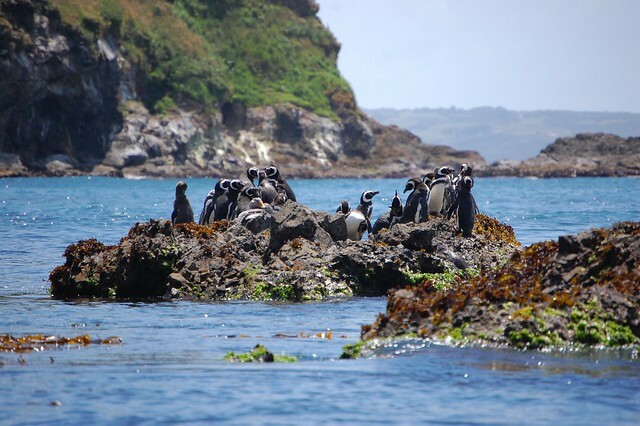 While many visitors head straight to Castro, I recommend spending more time in Ancud and exploring the northern part of the Isla Grande de Chiloé, including the nearby penguin colonies at Puñihuil, subject of my next post! 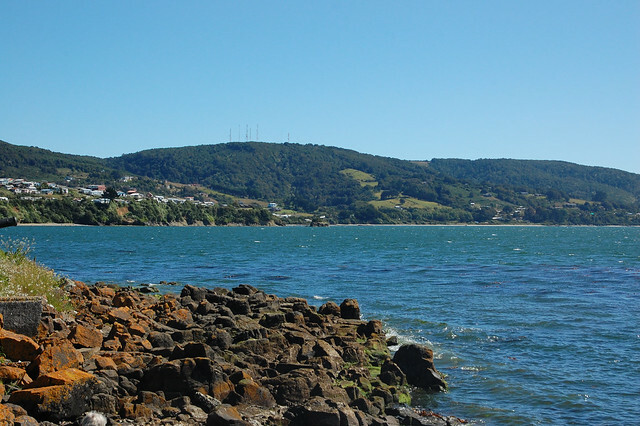 While the town of Chacao is the entry point to the Isla Grande de Chiloé, most visitors first experience Chiloé in Ancud, the major city at the northern part of the island. Cruz del Sur is the bus company dominating travel around southern Chile and Chiloé, and also owns the ferries crossing Canal Chacao. The bus stops at the Terminal Municipal on the outskirts of Ancud, where you can transfer to buses to other smaller towns in Chiloé. If you are going to Ancud, stay on the bus until you get to the Cruz del Sur terminal in Ancud proper. Most hostels are located near this terminal, making it easy to walk to them. I stayed at Hostal Nuevo Mundo due to its location right on the water, and thought it was a pleasant enough hostel, although not particularly friendly. They had a lovely breakfast and great views from the greenhouse-like porch. My travel buddy stayed at nearby 13 Lunas, and she raved about its social atmosphere and views from the balcony. 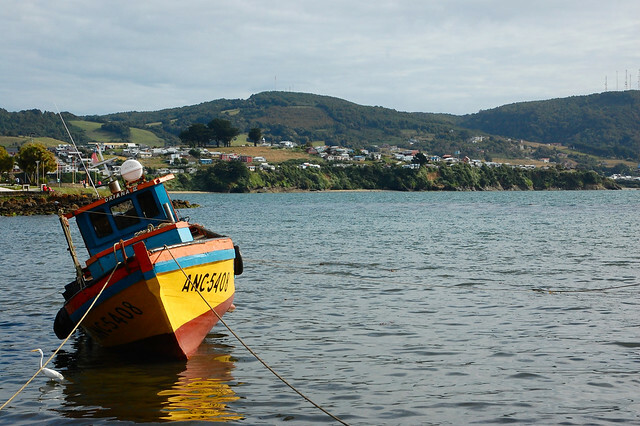 If you like Ancud’s vibe, you may want to consider basing your explorations of Chiloé from there. 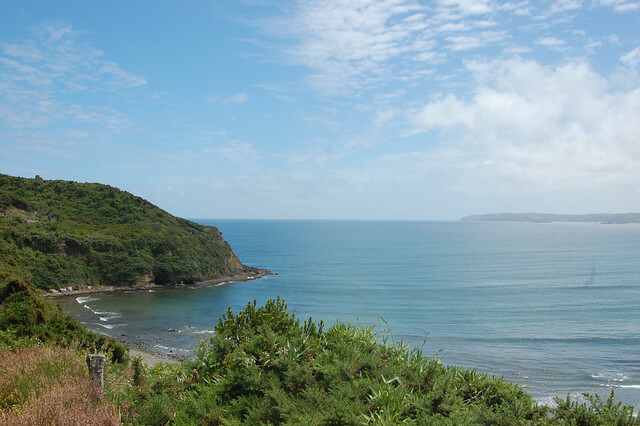 We ran into travelers visiting Cucao from Ancud on a day trip. 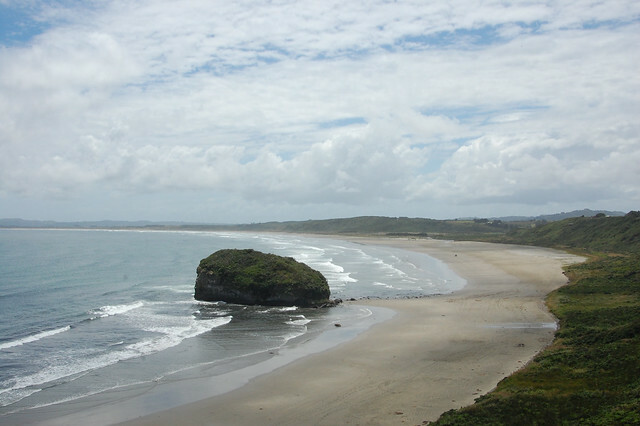 I much preferred Ancud to Castro and wished I had just stayed in Ancud, exploring Castro on a day trip. I definitely recommend eating at Restaurant Corita and Café Bar Nerudiano. There are a number of other cute restaurants around the area. 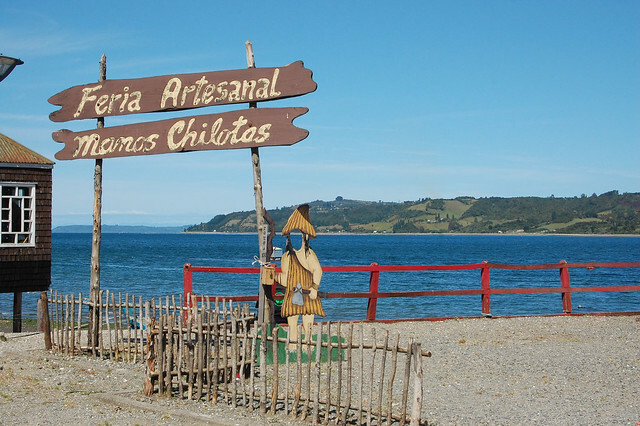 If you eat seafood, you should definitely try curanto, Chiloé’s classic meal, in Ancud. Great article on the experience here. 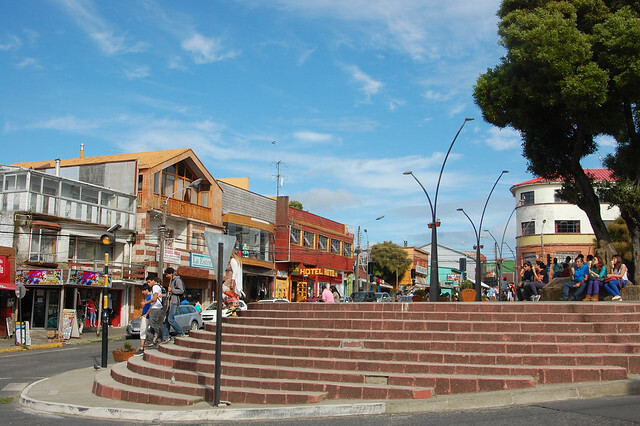 Make sure to check out the Mercado Municipal Ancud, located on Av. Libertad between Calle Dieciocho and Calle Arturo Prat. Here, you can find seafood, cheese, and other food products, and many stands with handmade wool items and other souvenirs. 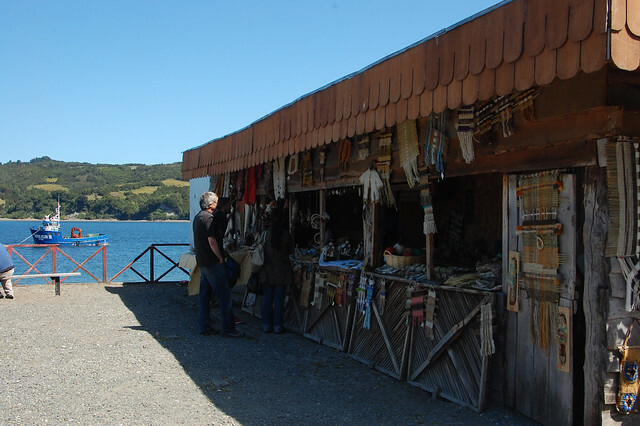 This is where I bought my books on the myths of Chiloé and booked my tour to Puñihuil. Make sure to visit the Plaza de Armas to see the new cathedral. 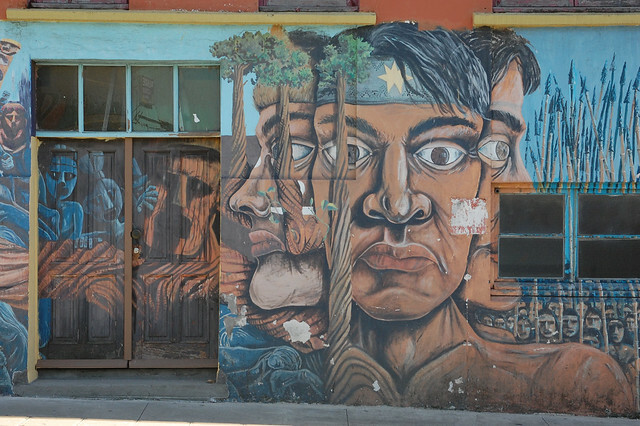 You should also visit the Museo Regional, at Libertad 370, right off the Plaza de Armas. Entry is free. There are a few souvenir and artisanal shops located around the Plaza de Armas. 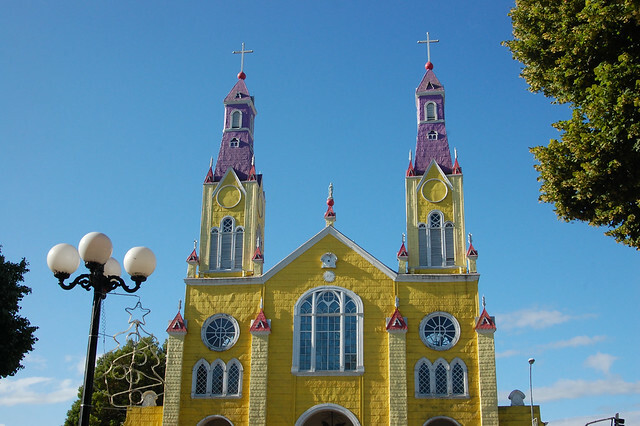 Visiting the Centro de Visitantes de Iglesias de Chiloé is a must to get a sense for the architecture of the unique churches, even if you’re not a big fan of churches in general. You can find the Visitor’s Center at Federico Errazuriz 227. They also have an on-site café and a small shop where you can buy cool posters of the churches. You can read more about the churches in UNESCO’s write-up. Although I didn’t get to see it, the Fuerte San Antonio (old fort) located in the northern part of Ancud seems to be pretty cool. 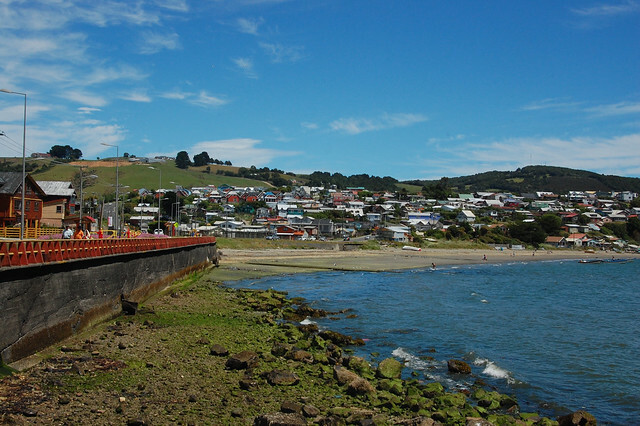 Wikitravel has a nice list of more things to do in Ancud. If you’re interested in learning more about the mythology of Chiloé, this NPR article is a good place to start. 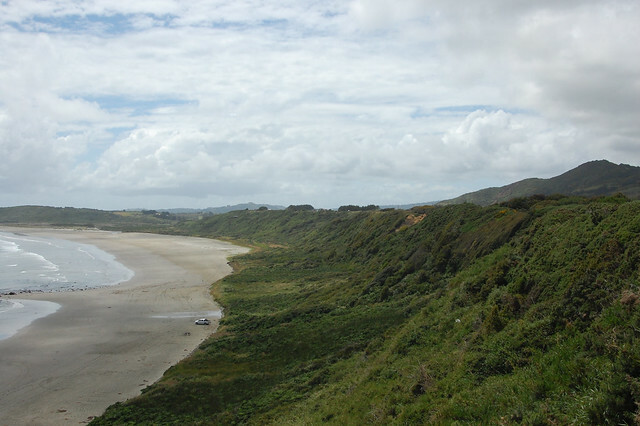 If you read Spanish, there are a number of websites documenting the stories told about the island (just do a Google search for “mitos y leyendas de Chiloé”). 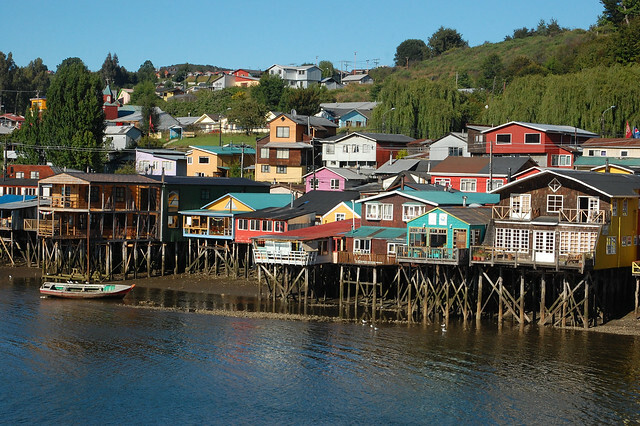 This is a nice explanation of the cultural history of Chiloé. 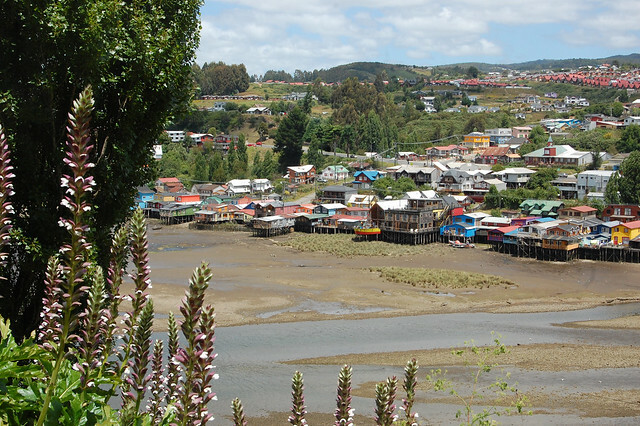 If you visit Chiloé, make an effort to understand its culture and history. This is a rural area where the main industries are farming and fishing, and life moves slower here. 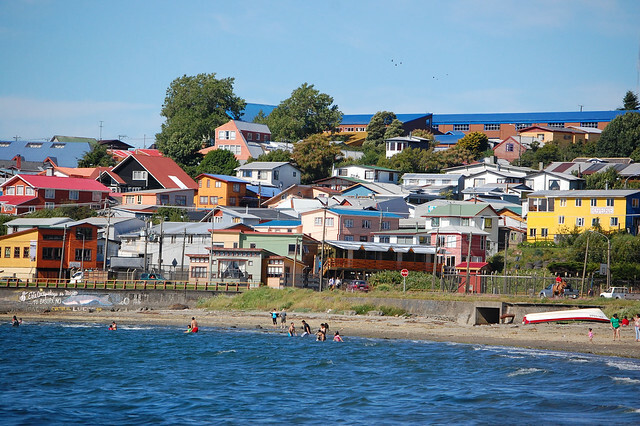 That’s part of the appeal; if you want a lively city, try Puerto Montt and Puerto Varas!